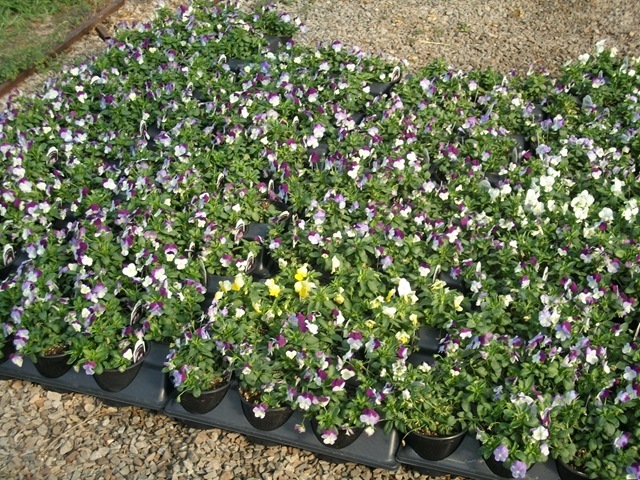 We are out of almost all the J6 Pansies. 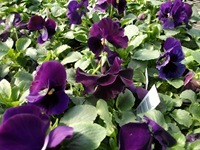 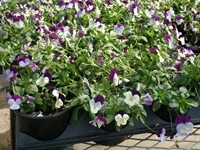 We have some 1801 Pansies left as well as some J6 Violas and Panolas. 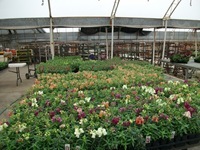 Plus more odds and ends that you can see in the pictures and on our Current Availability. 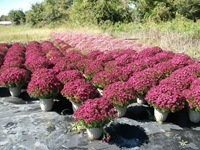 Oh and the #12 Purple Mums we have left are on sale. 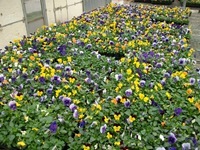 We are almost out of mums and into our last crop of pansies on some colors and pulling for 2 crops of pansies in other colors. 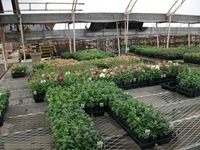 Take a look at the inventory to see what we have left. 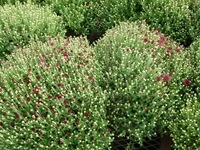 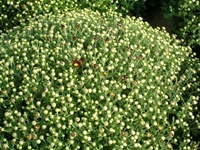 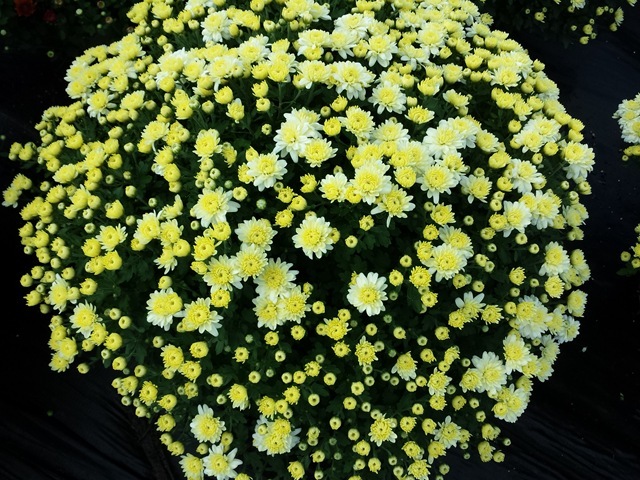 This is what the mums look like. 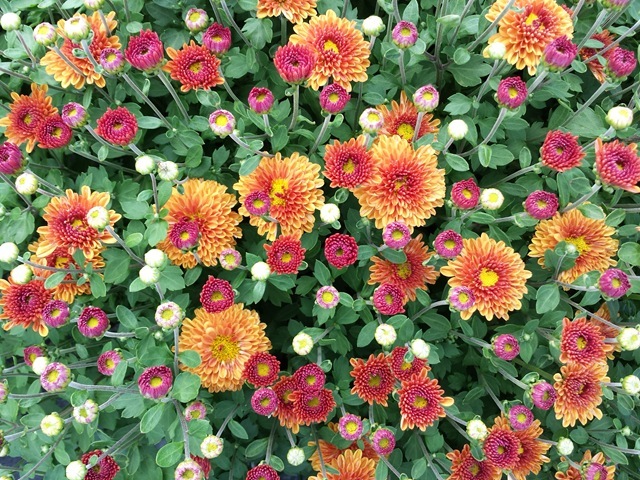 These will keep coloring up more each day. 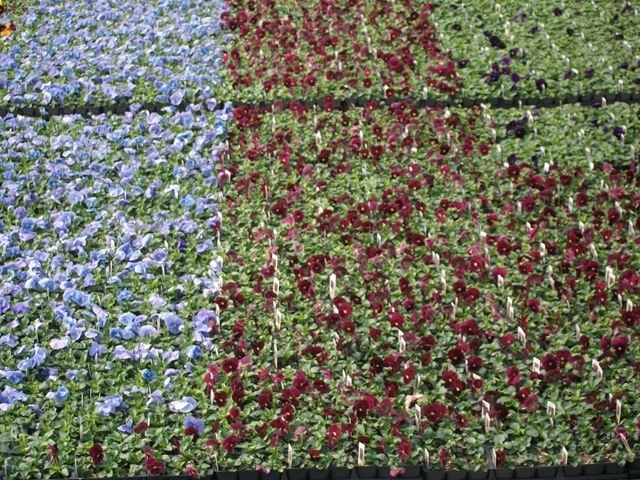 We mostly have purple left. 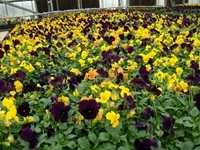 This is what our 1801 pansies are looking like. We will do a physical count and update our available numbers Friday 10-18-13. Out of time, but I do have pics and video! 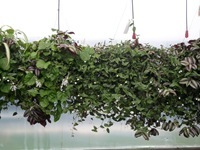 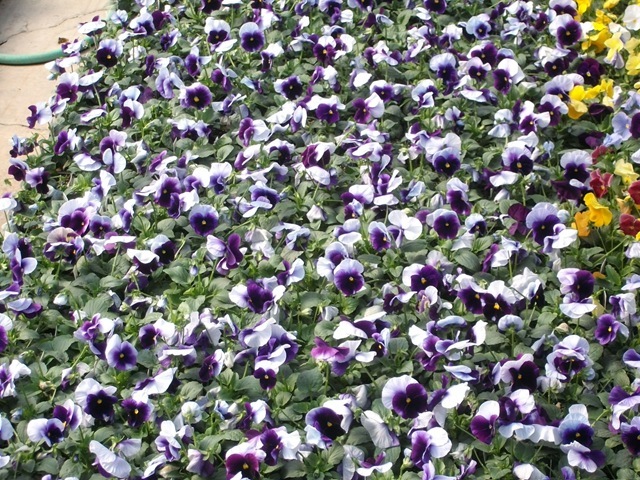 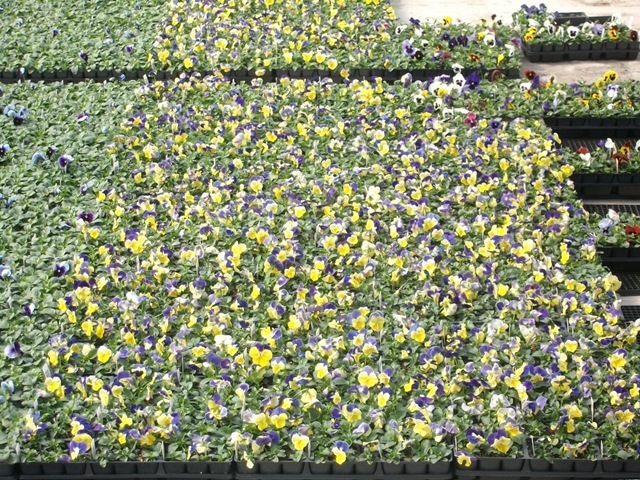 Here is a quick video of our crop of pansies that will be available on Monday< Oct. 14, 2013. 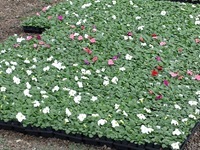 A lot of them need a few more days to fill in despite the good color they are showing now. 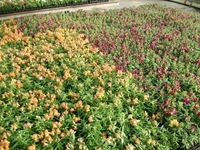 We are pulling a few colors now though. 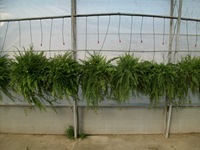 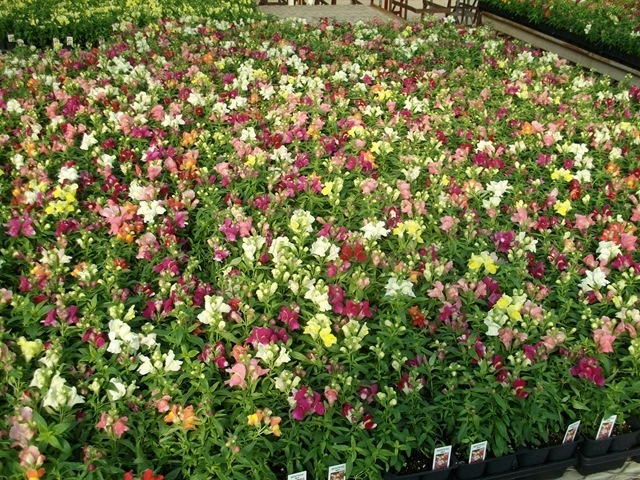 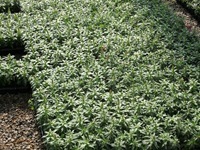 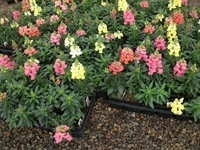 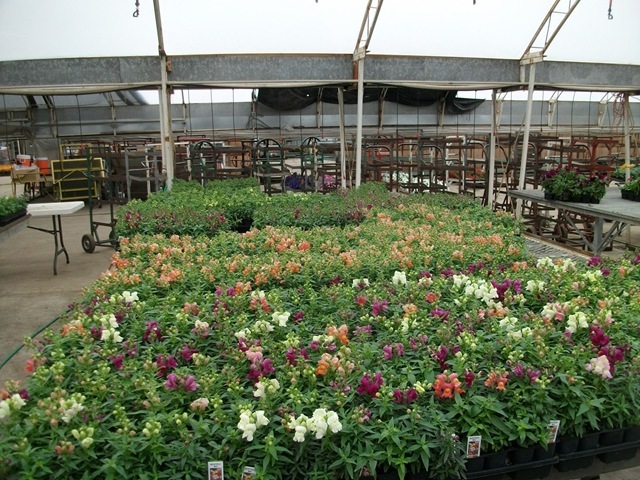 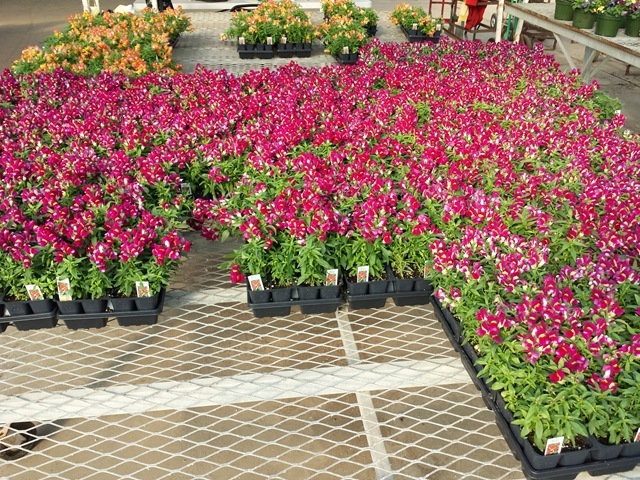 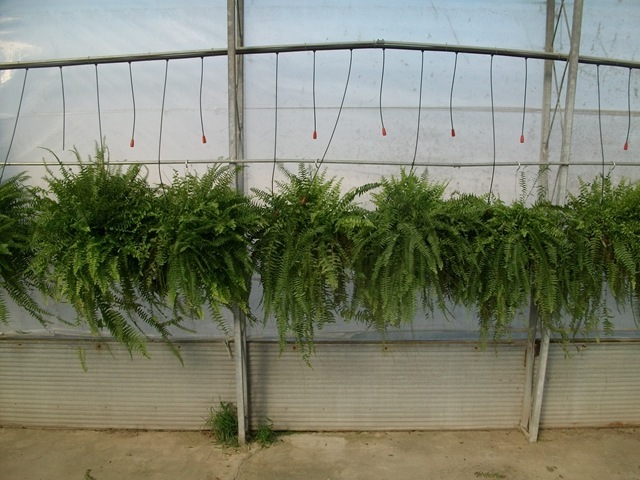 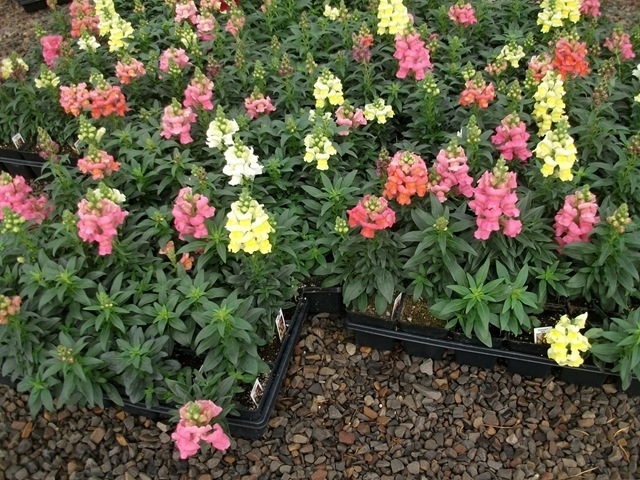 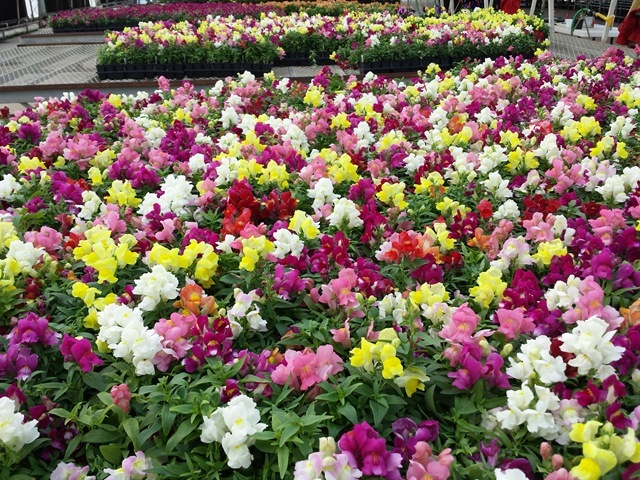 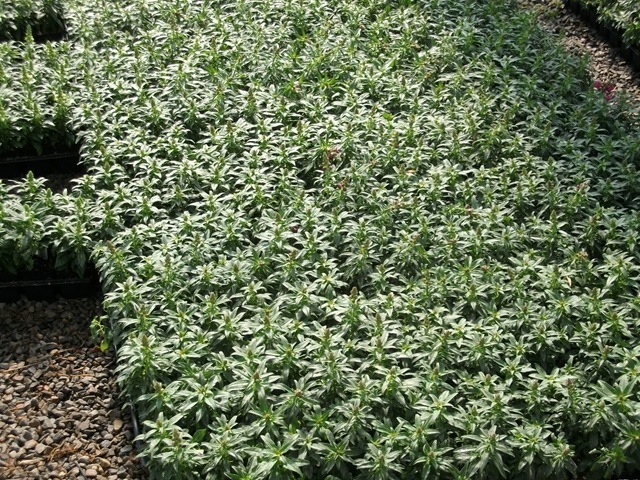 Check out these Montego Snapdragons! 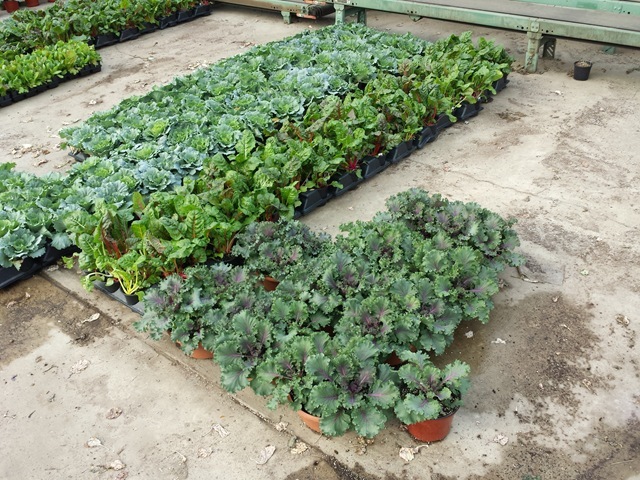 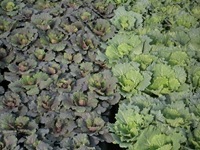 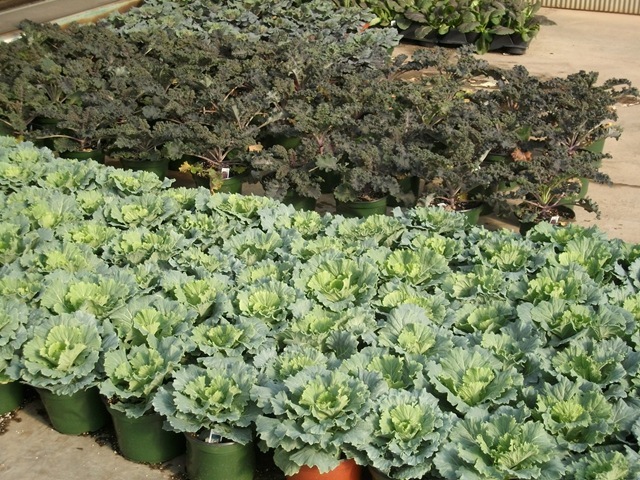 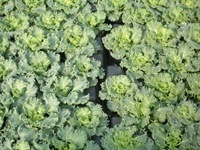 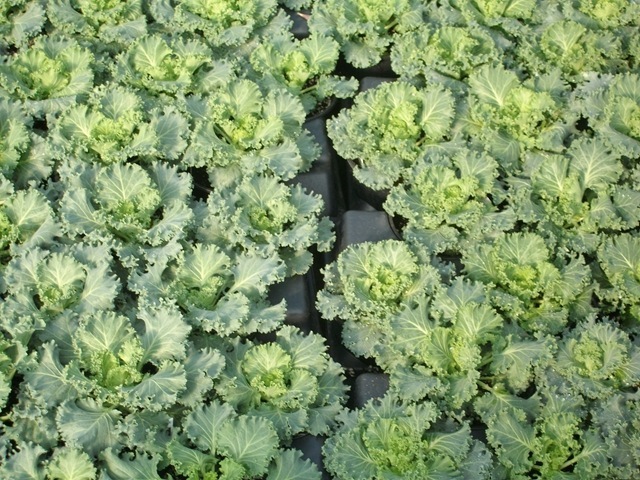 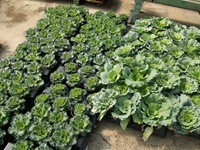 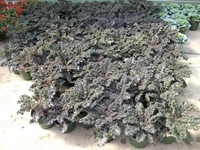 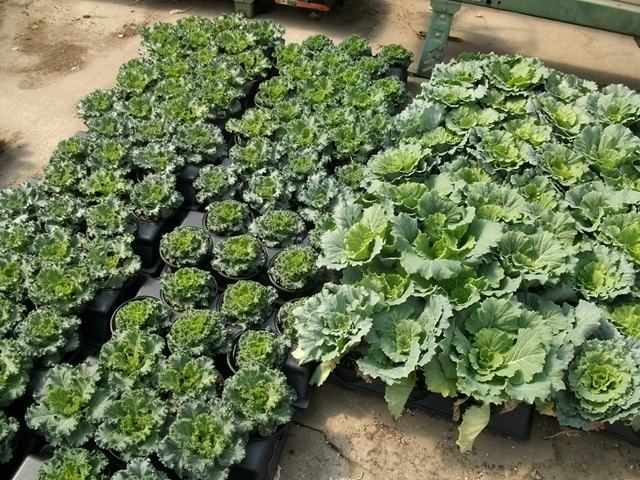 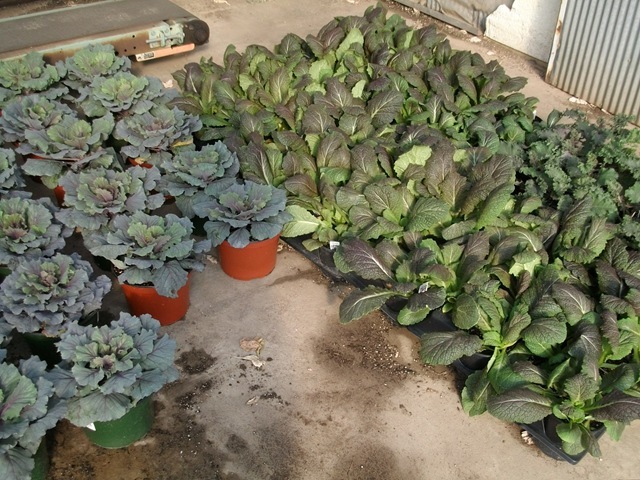 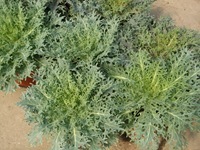 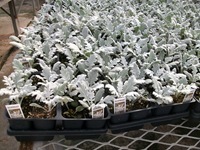 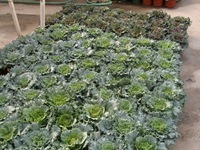 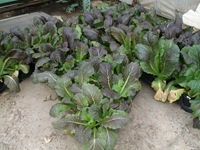 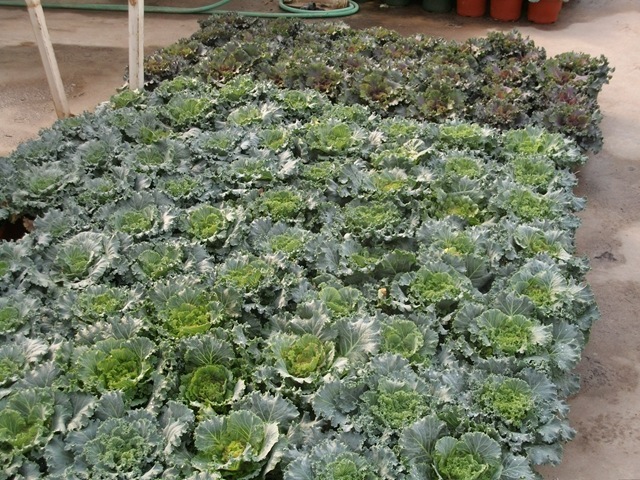 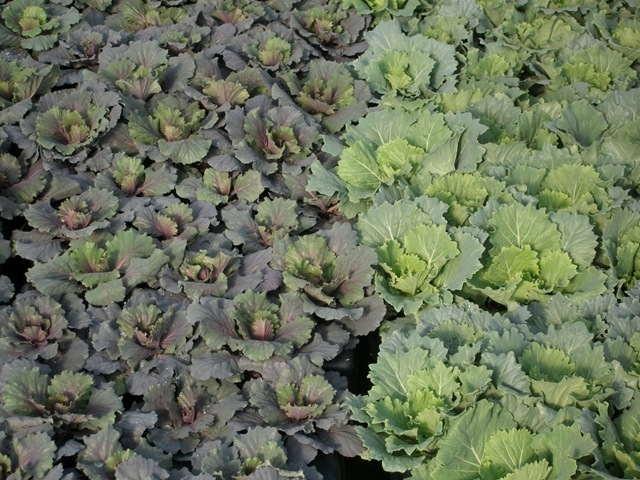 Ornamental Cabbage, Ornamental Kale, Swiss Chard and a few flats of J6 Lettuce if you look closely. 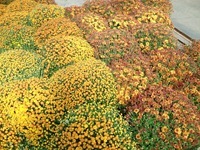 The last of the fall mums. 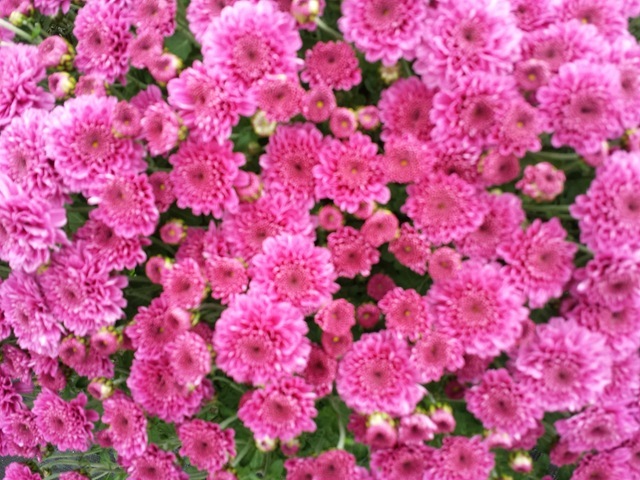 A very shaky video of the mums from my ATV. 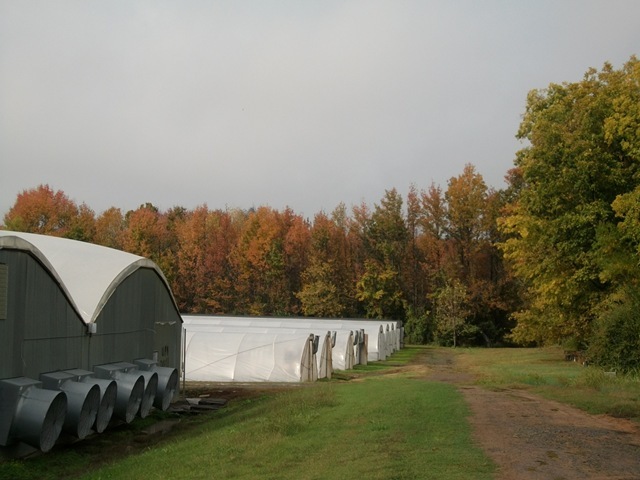 I have talked to folks this fall and everyone has a different opinion on how fall is going. 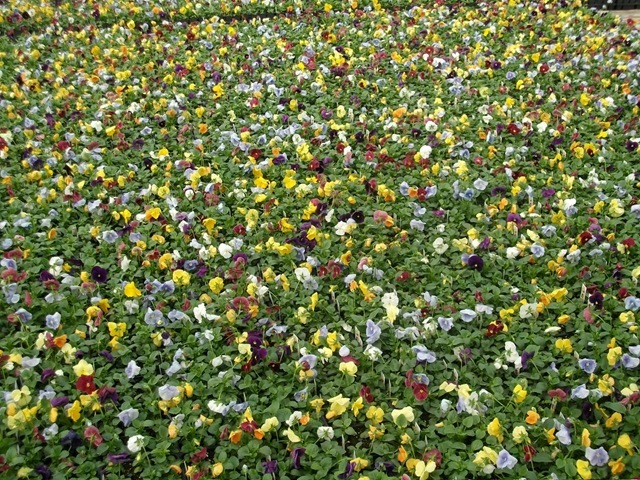 Some say that it’s tanking. 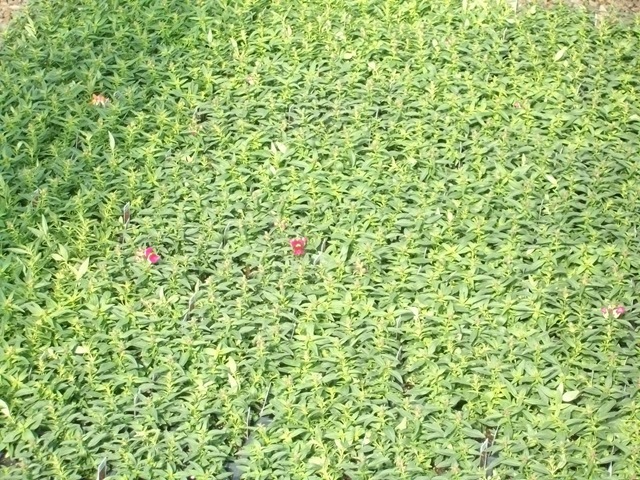 Others say it’s OK but hot. 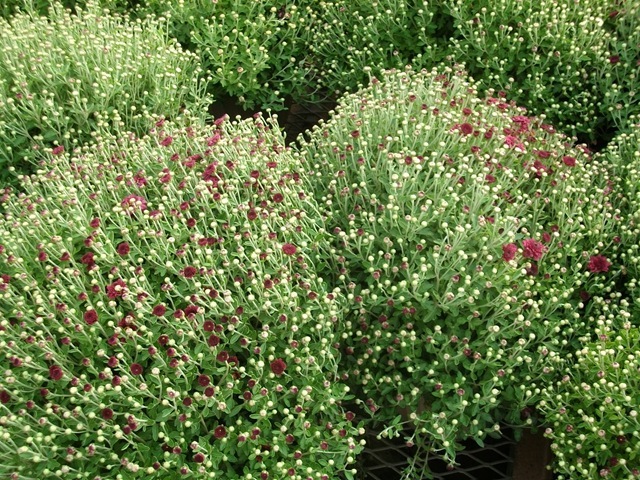 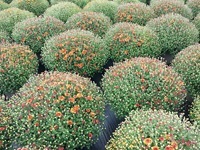 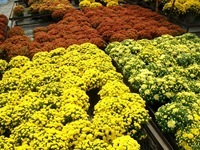 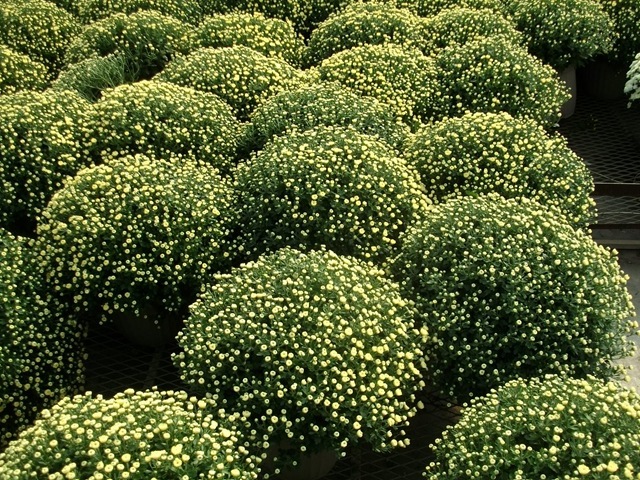 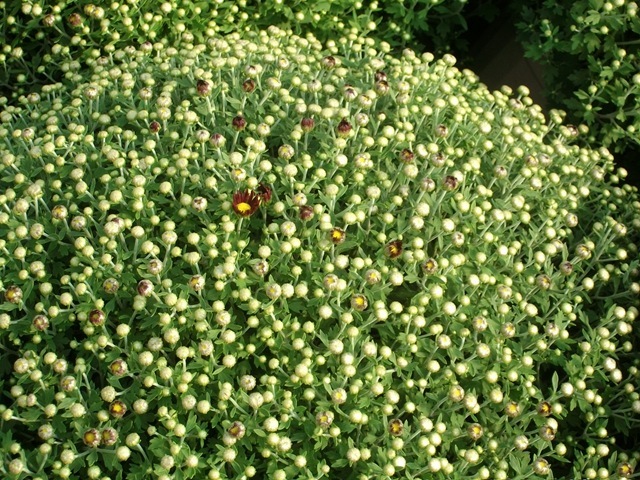 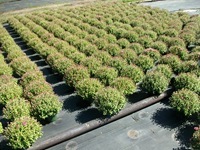 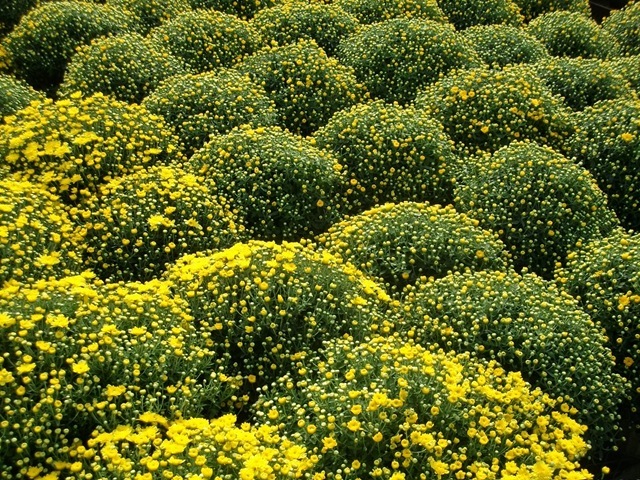 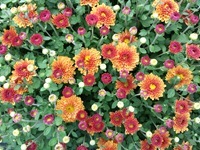 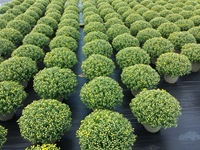 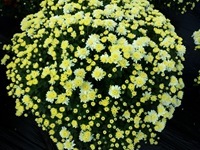 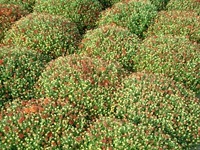 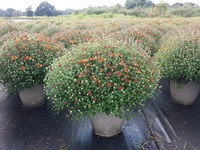 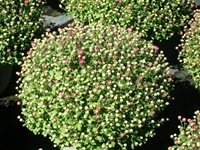 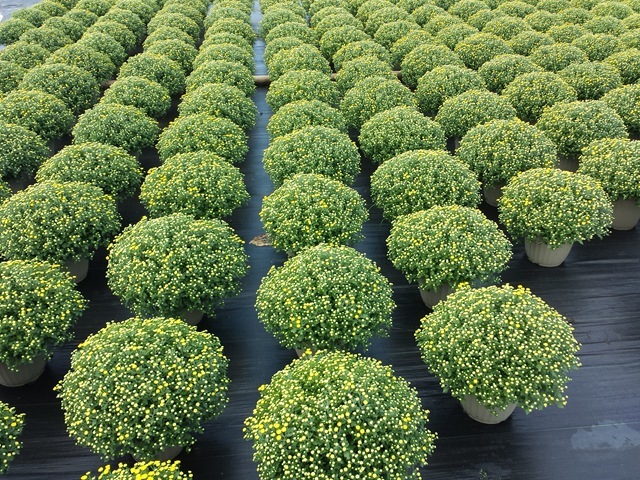 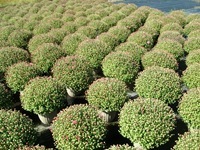 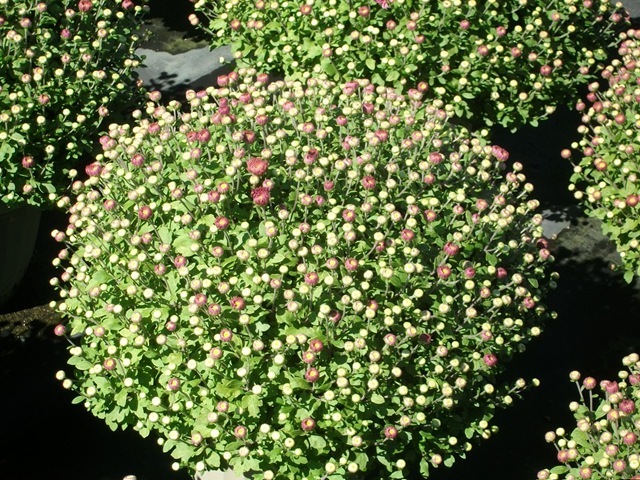 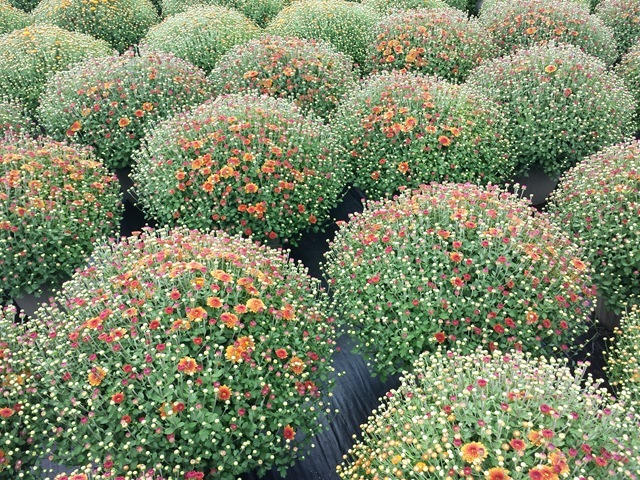 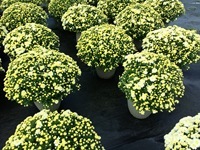 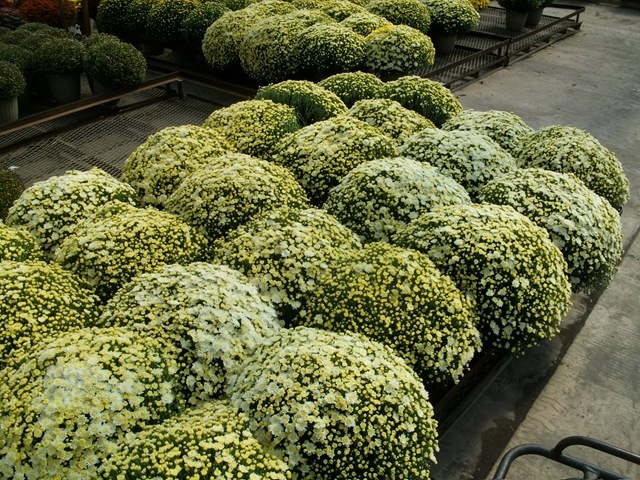 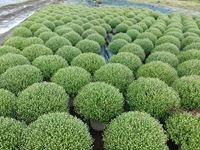 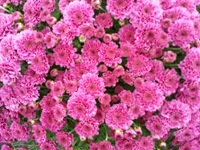 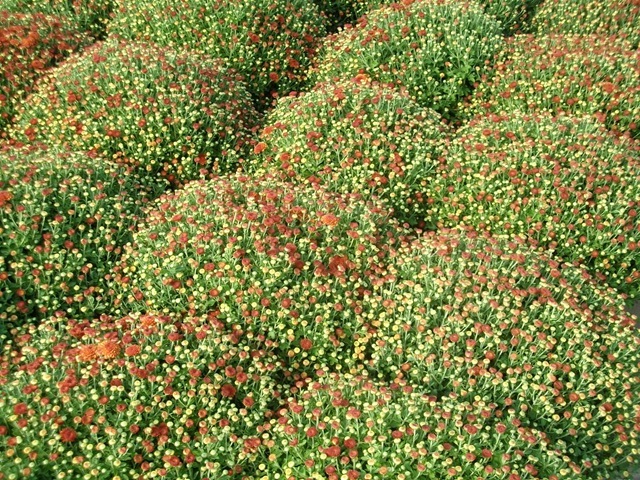 I hear that a lot of growers are out of mums (or out of yellow mums). 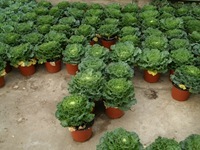 I hear that one grower will be completely sold out by the middle of next week while others have good availabilities. 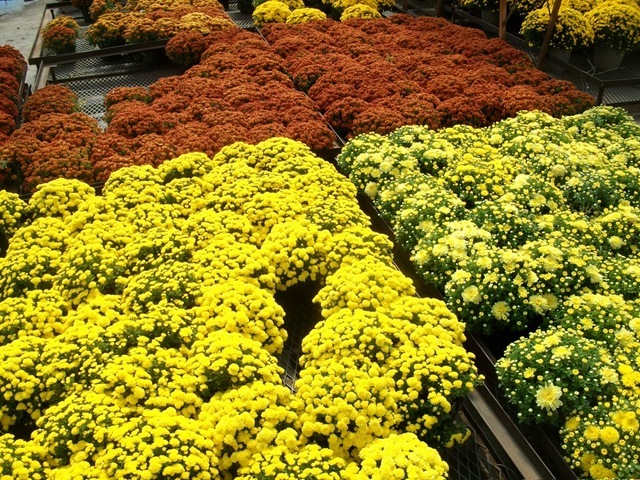 Basically, no one knows what to think about how to rate fall so far. I would rate it as average but with a possible positive rating depending on how we finish up October. 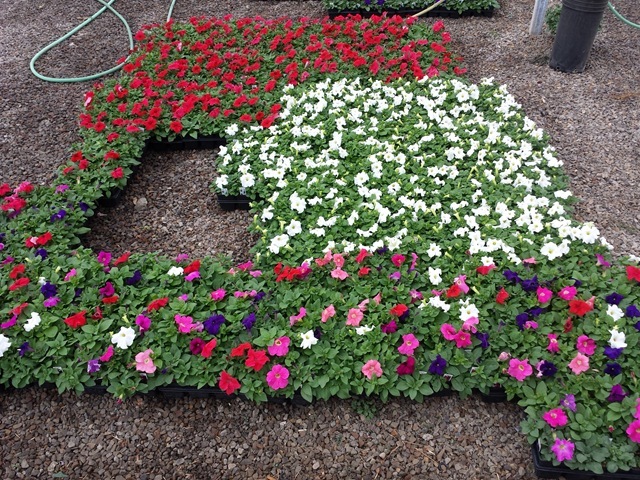 The landscapers just started this week. 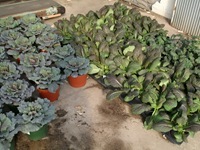 In fact, they all showed up on Wednesday. 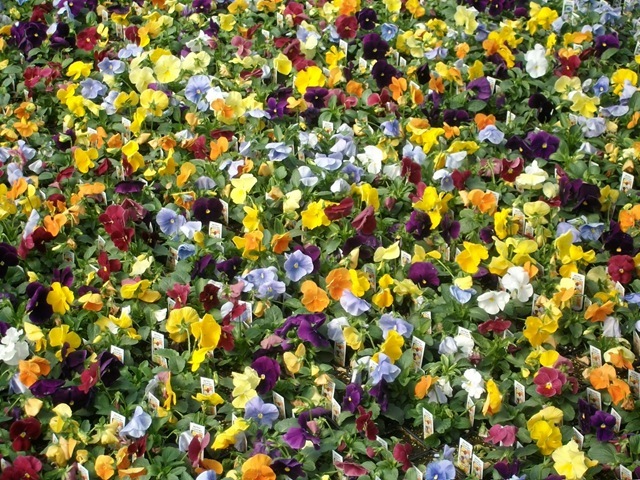 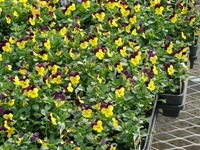 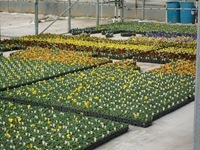 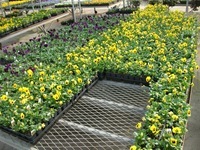 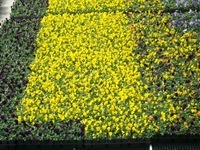 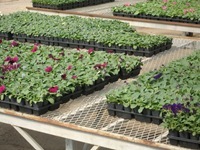 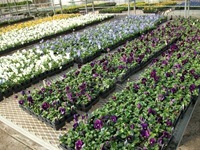 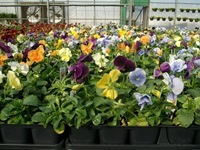 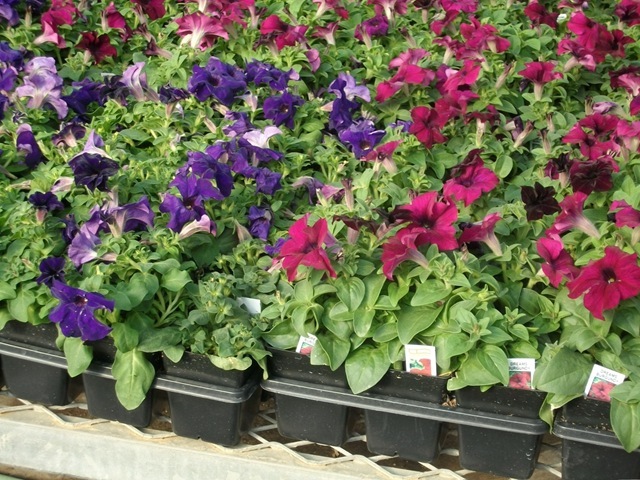 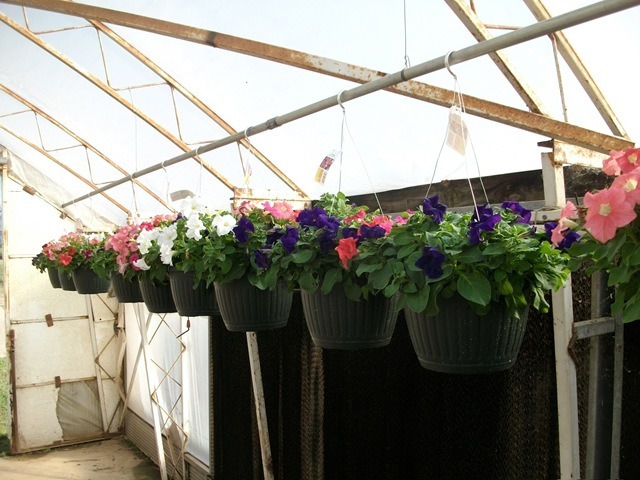 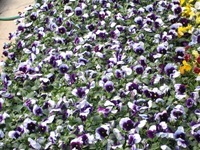 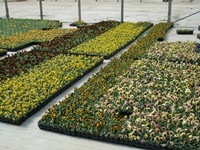 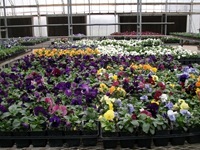 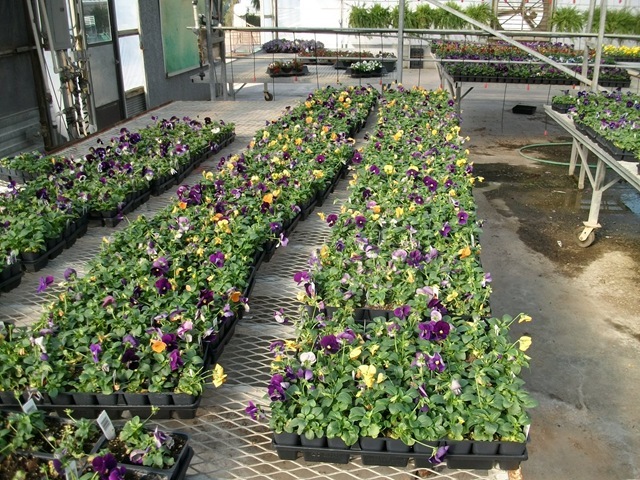 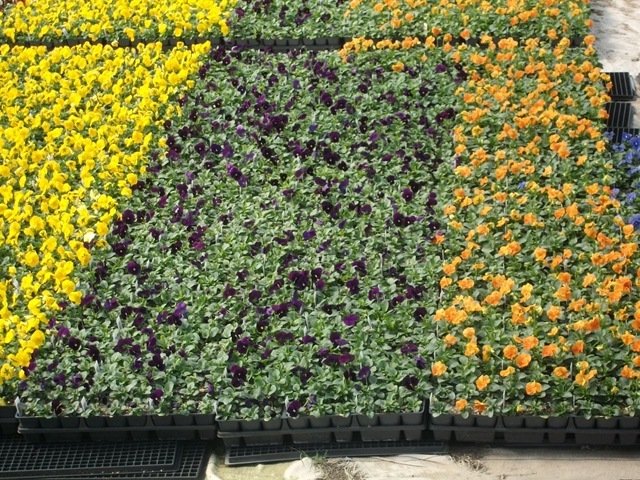 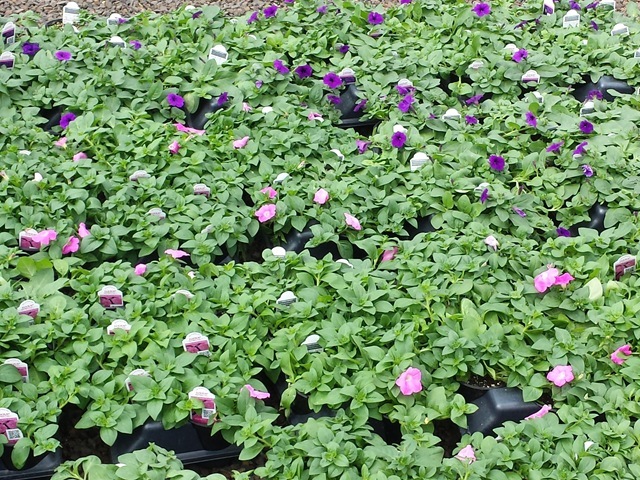 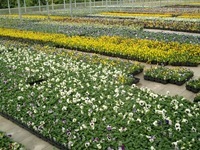 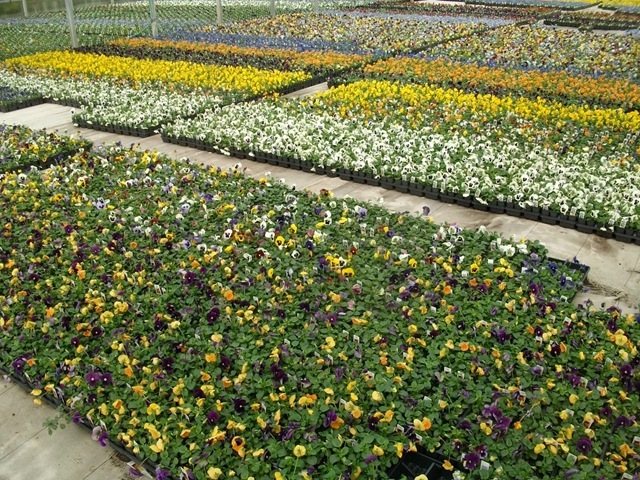 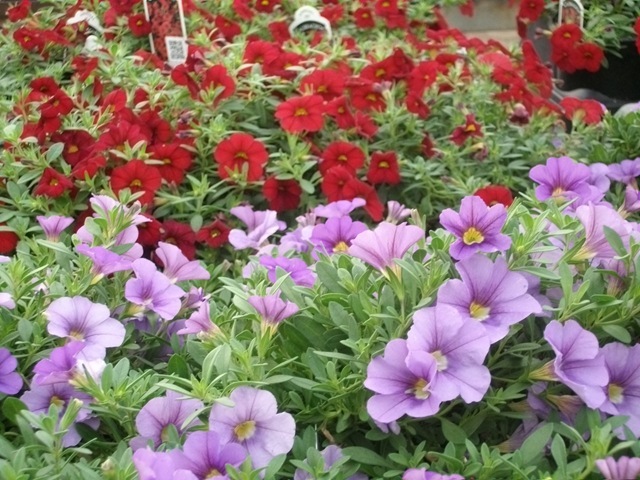 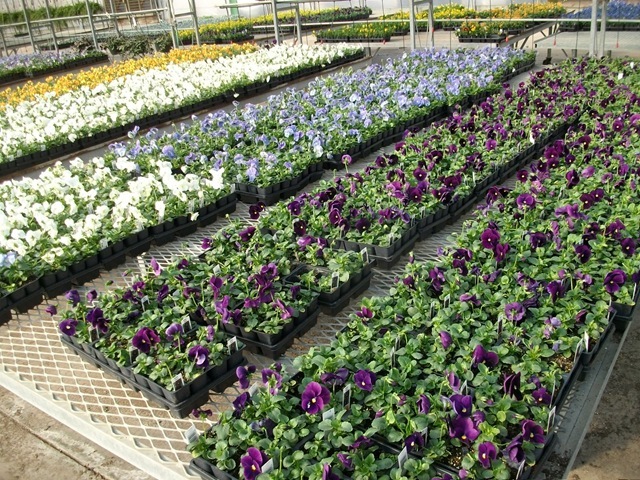 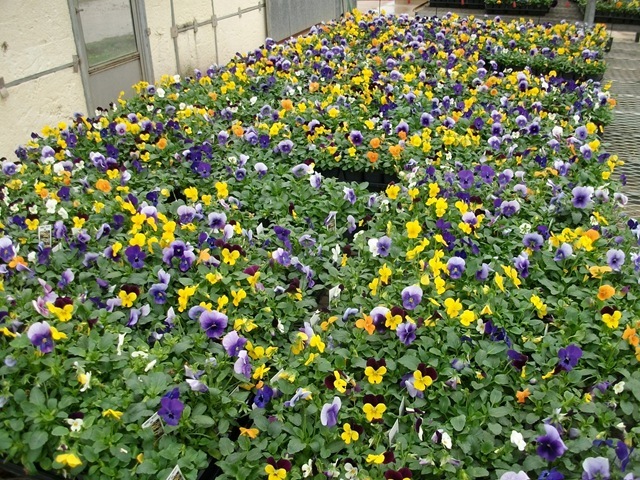 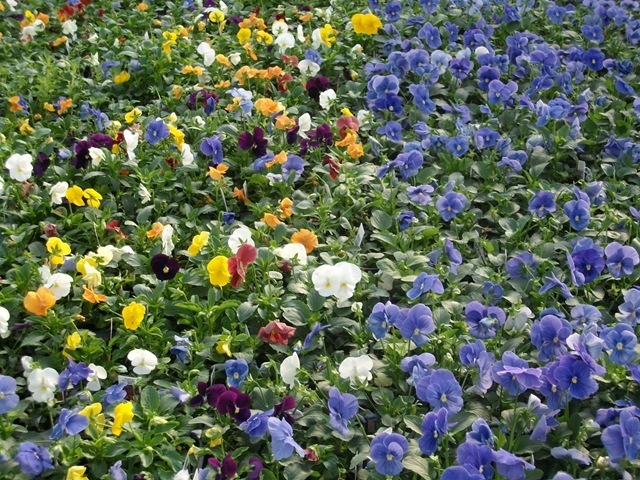 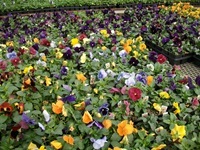 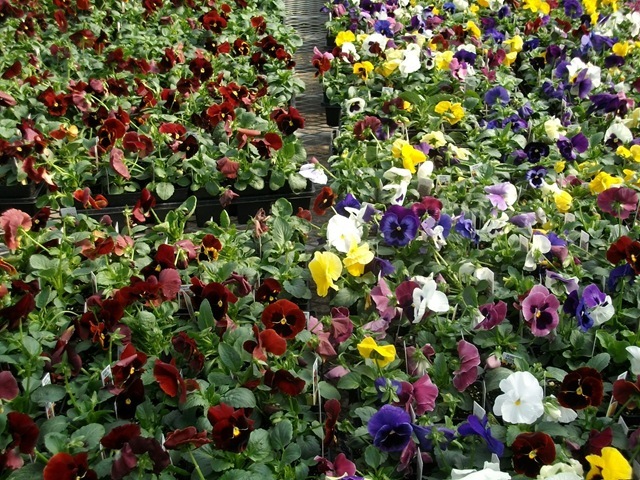 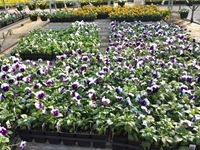 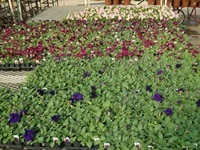 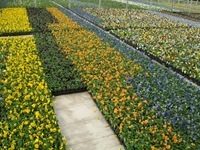 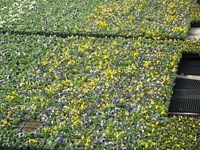 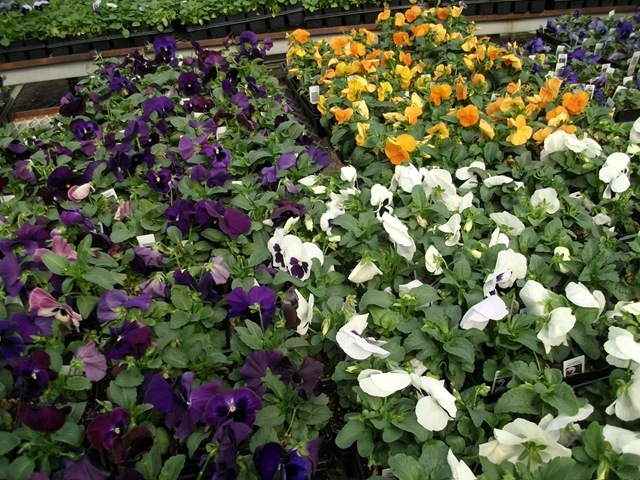 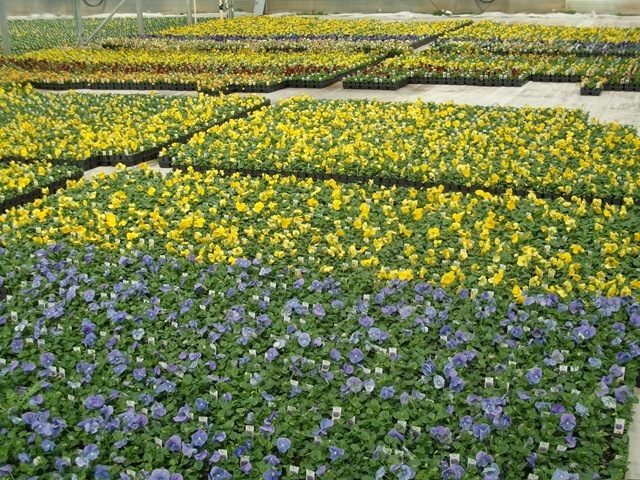 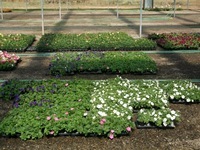 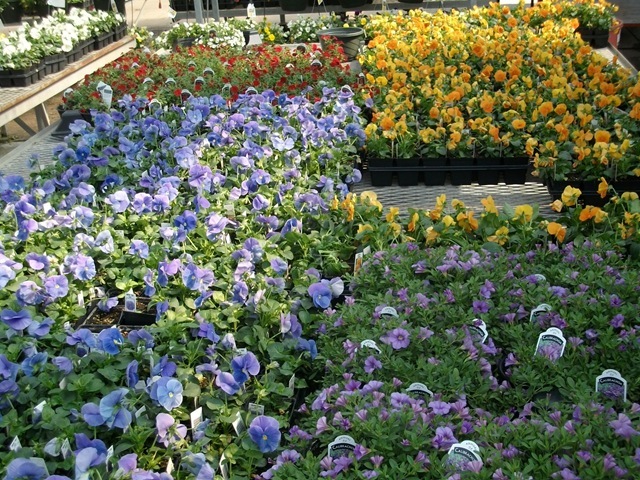 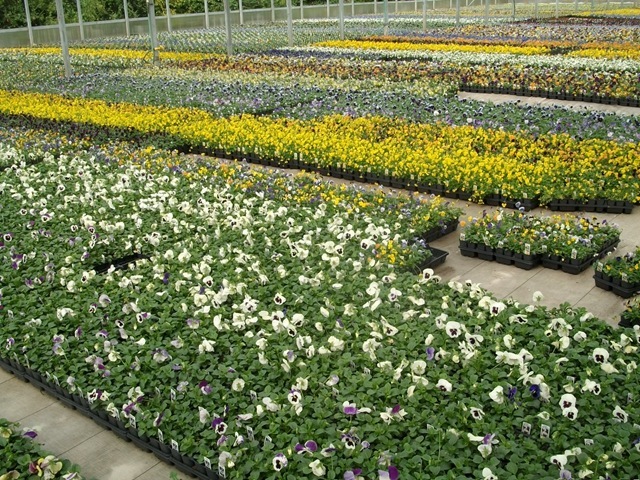 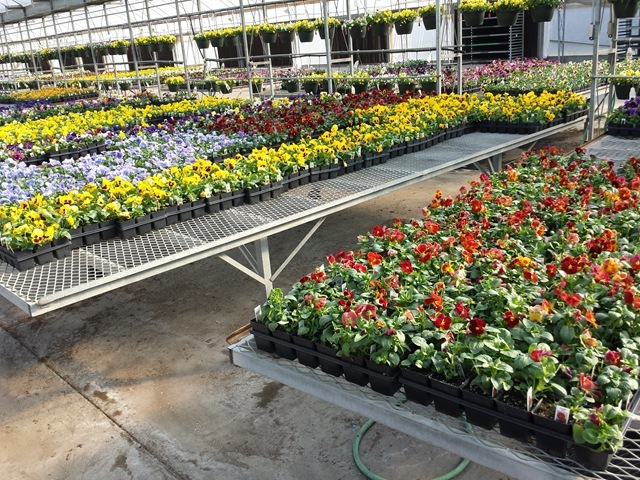 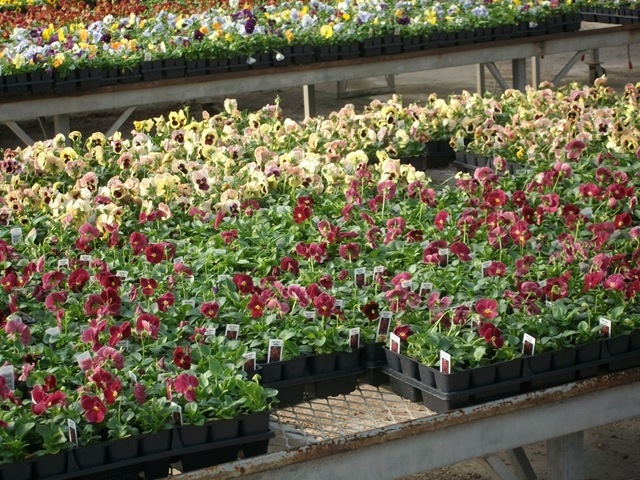 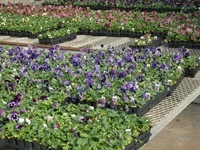 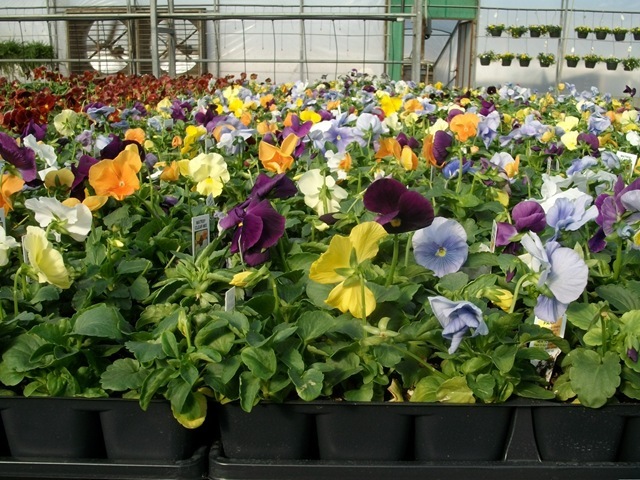 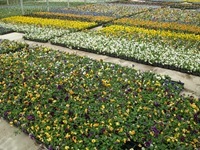 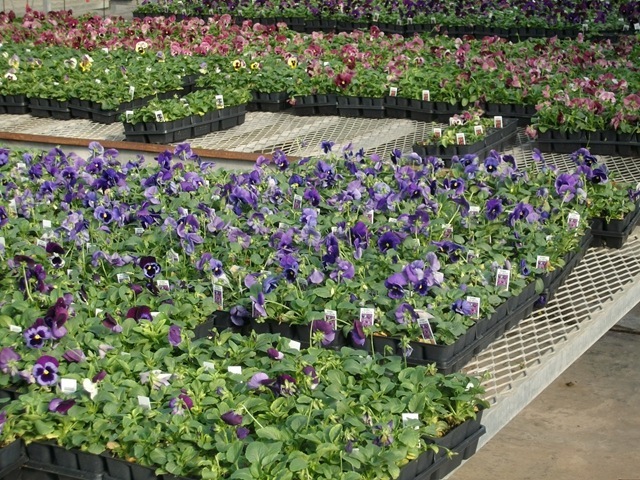 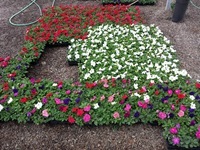 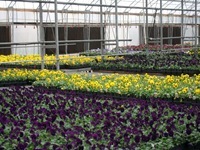 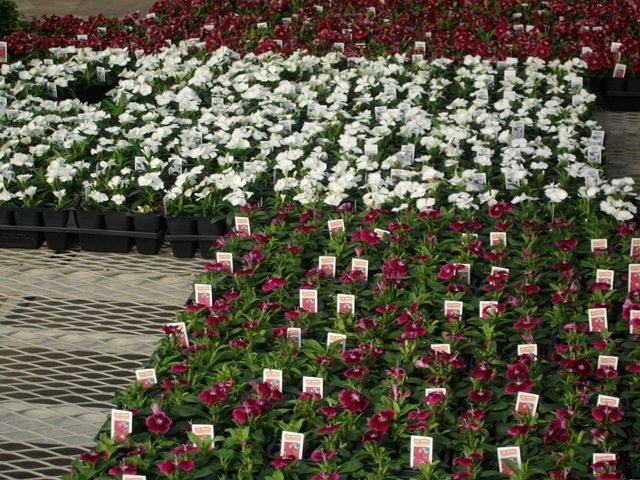 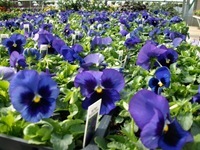 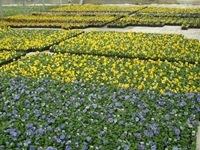 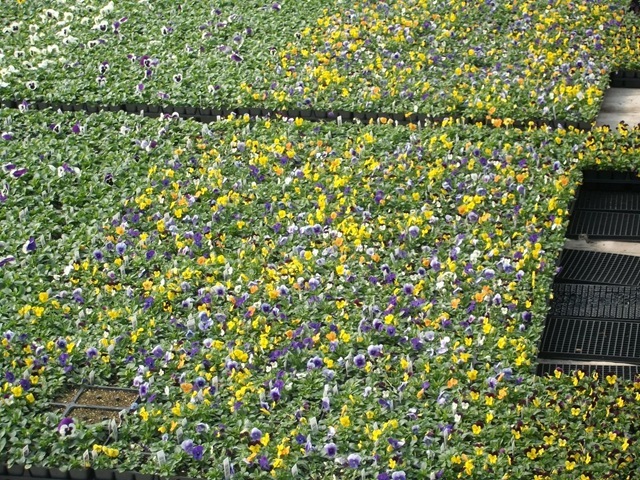 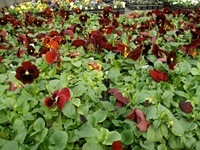 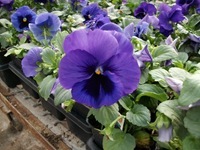 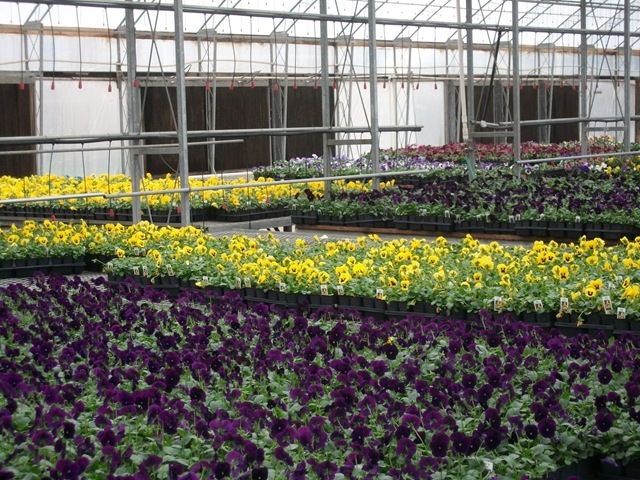 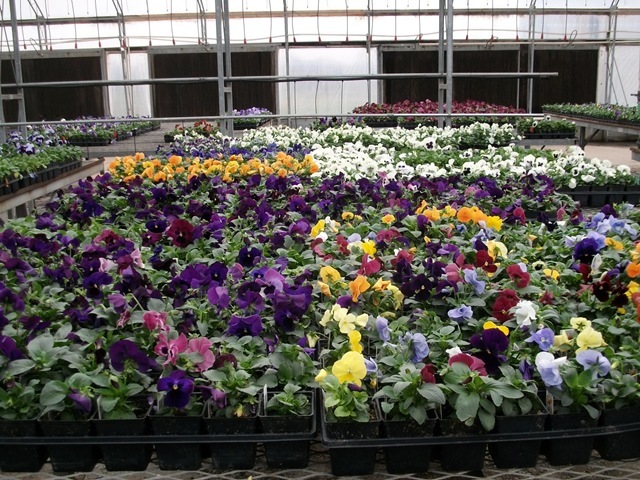 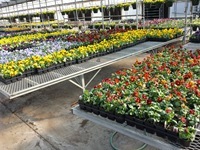 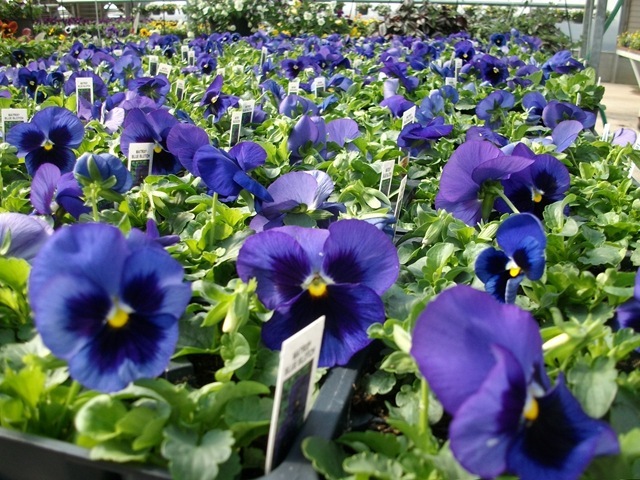 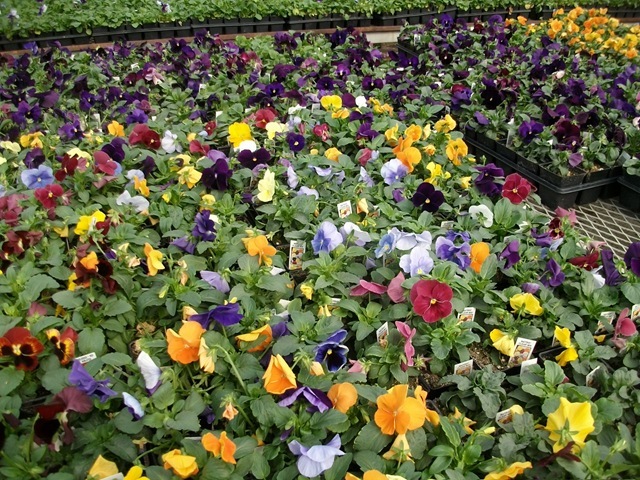 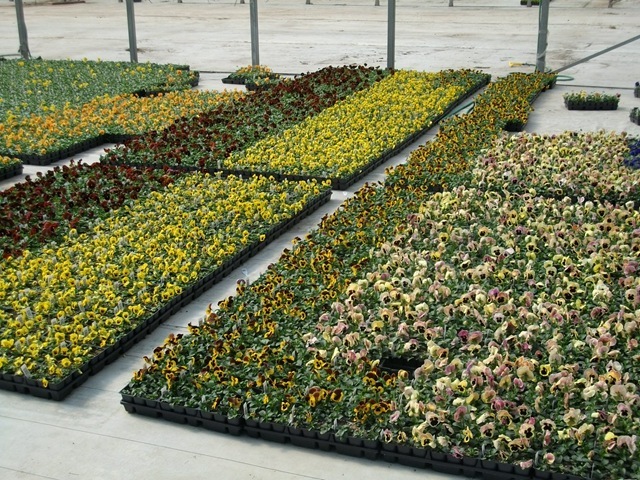 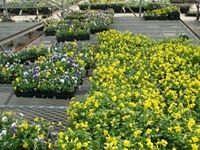 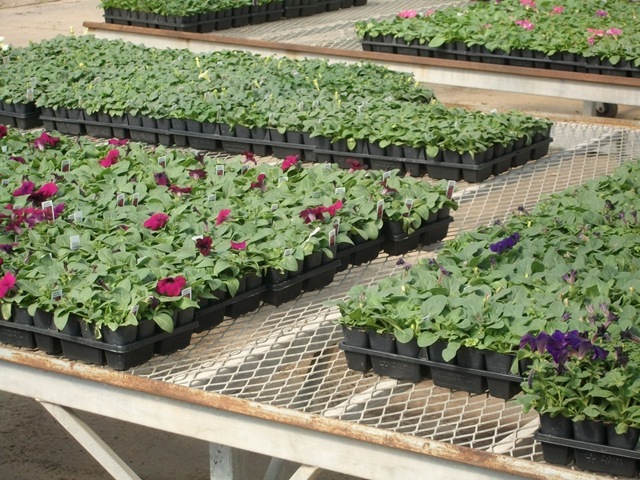 Our pansy sales will pick up as the landscape market kicks in. 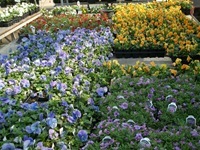 As always, the cooler weather will help sales along for everyone. 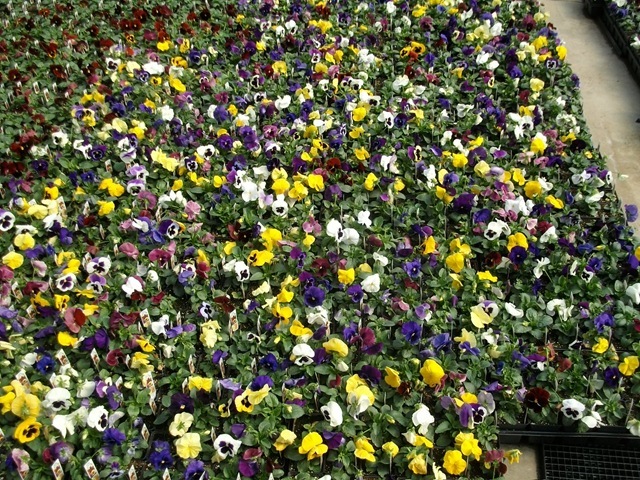 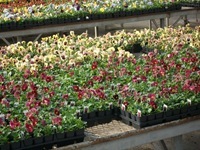 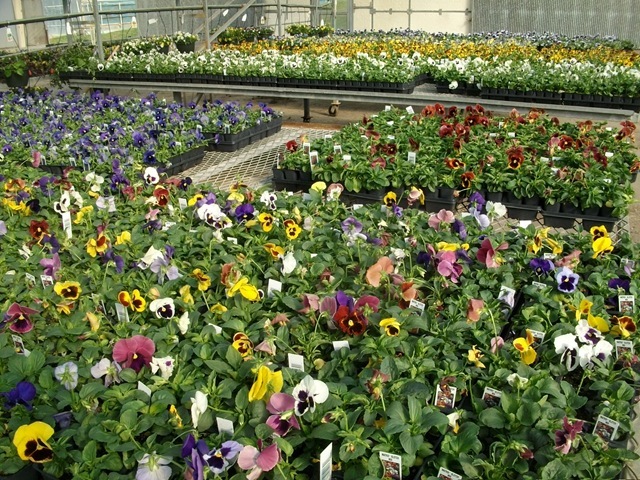 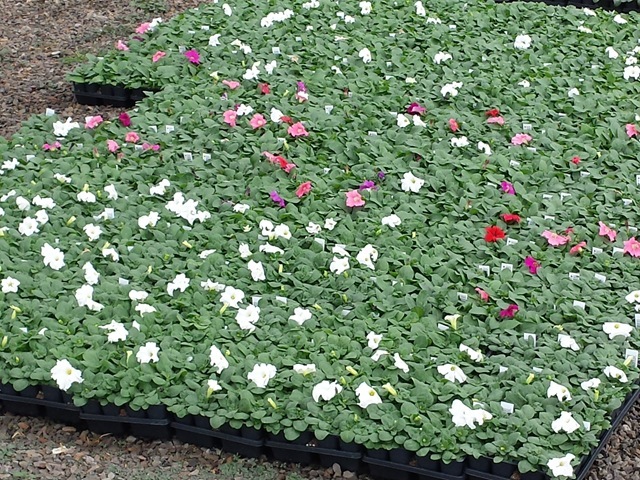 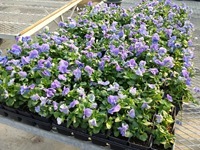 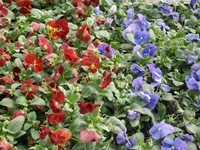 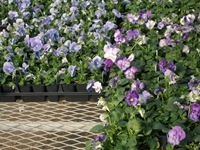 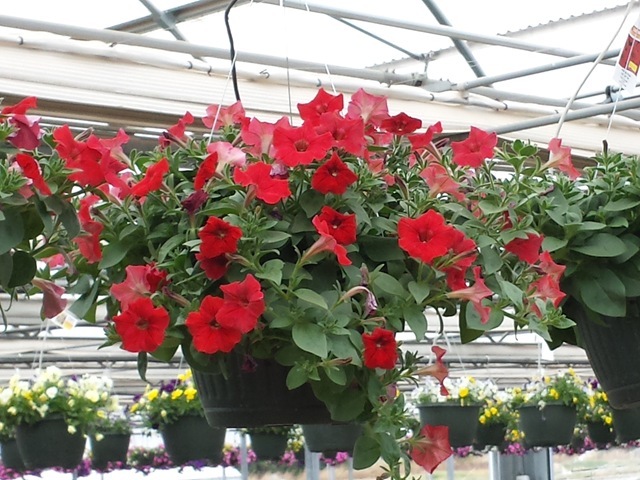 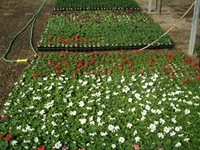 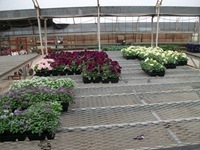 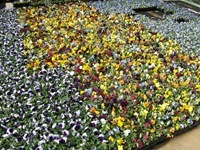 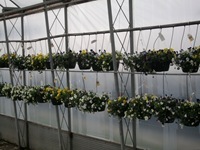 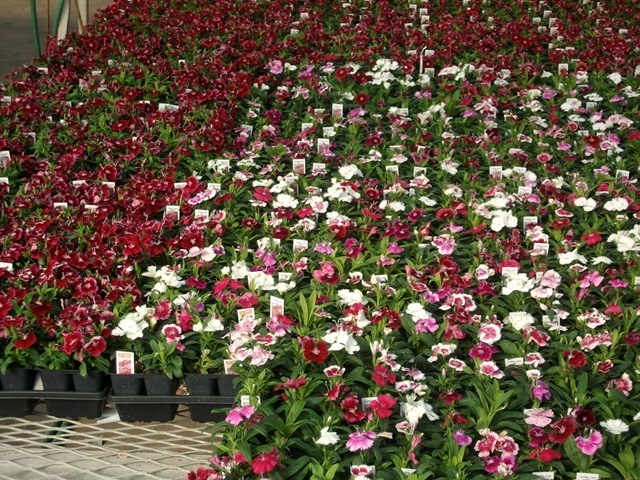 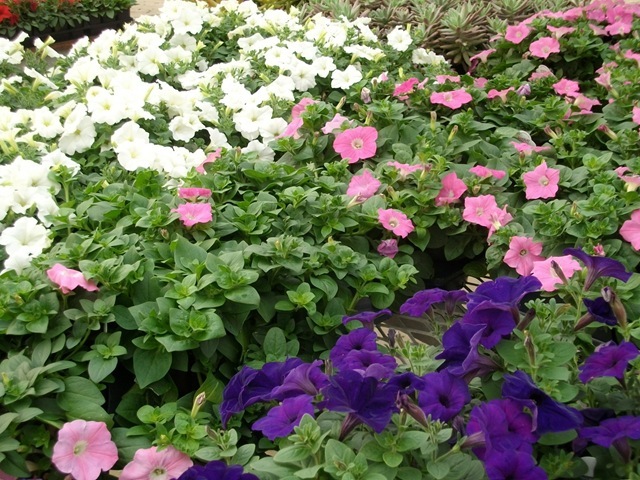 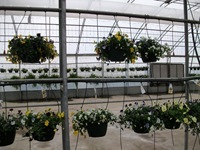 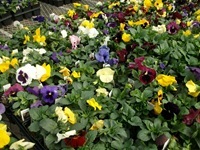 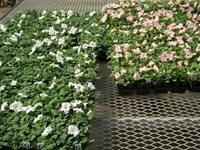 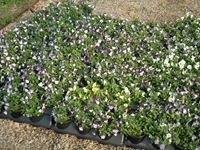 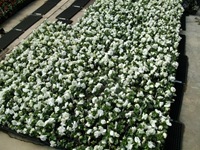 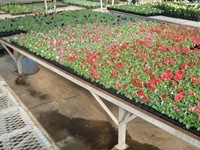 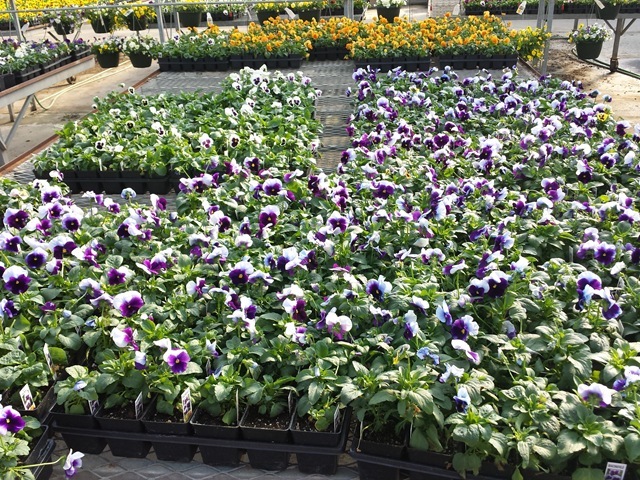 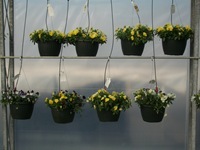 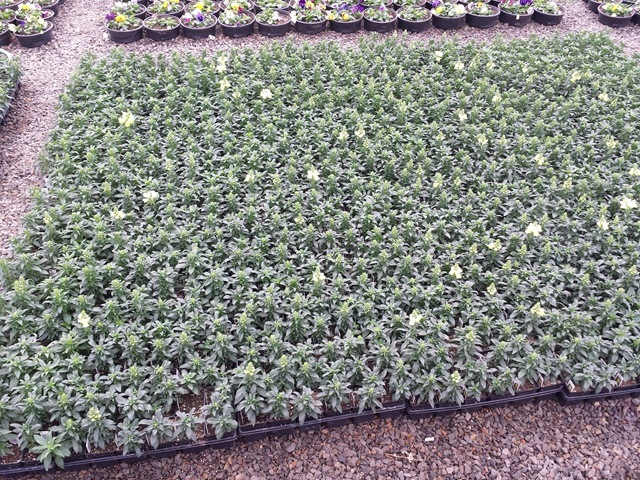 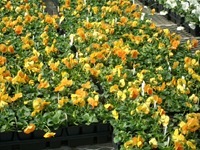 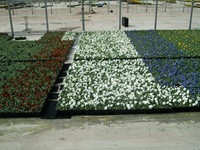 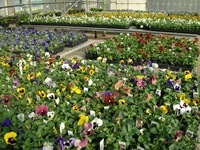 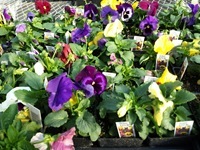 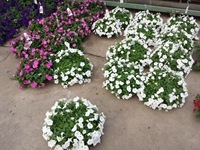 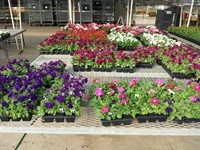 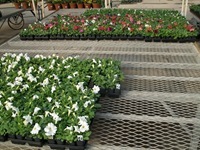 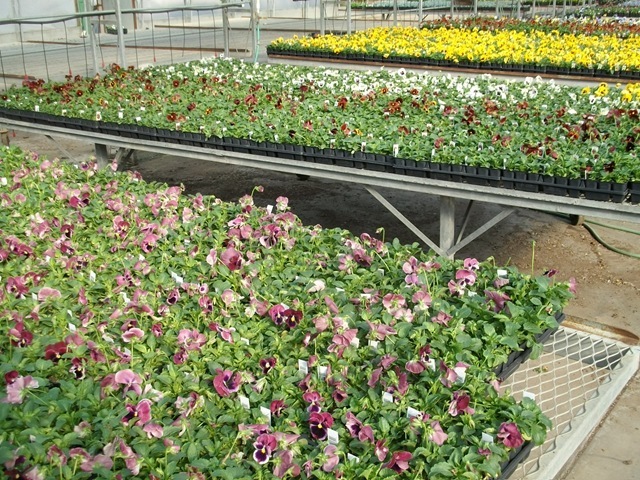 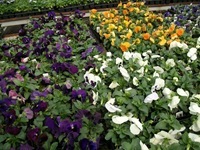 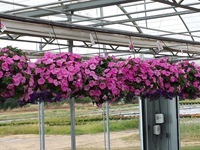 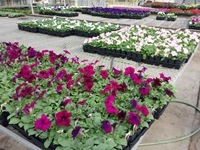 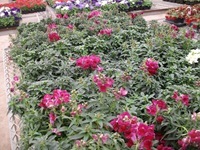 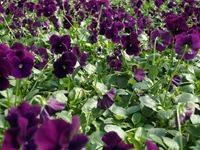 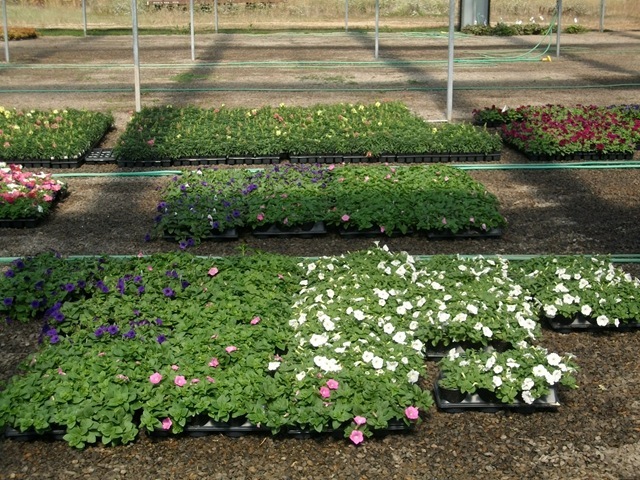 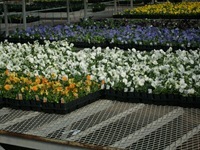 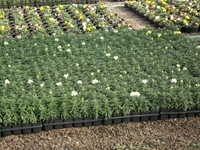 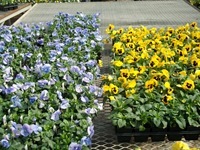 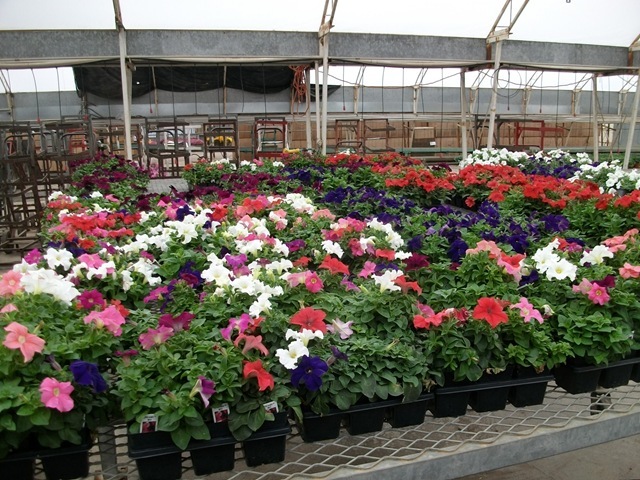 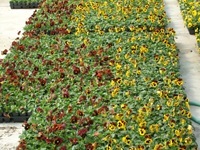 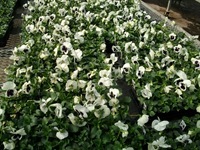 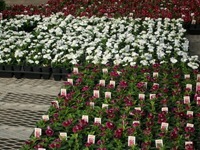 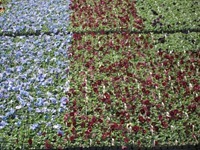 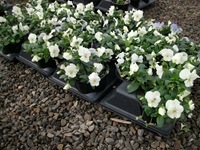 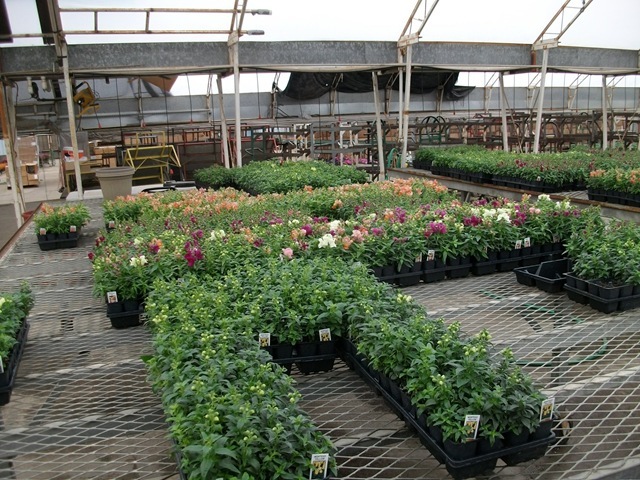 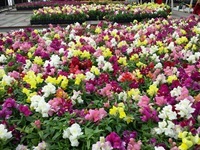 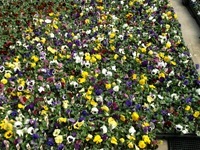 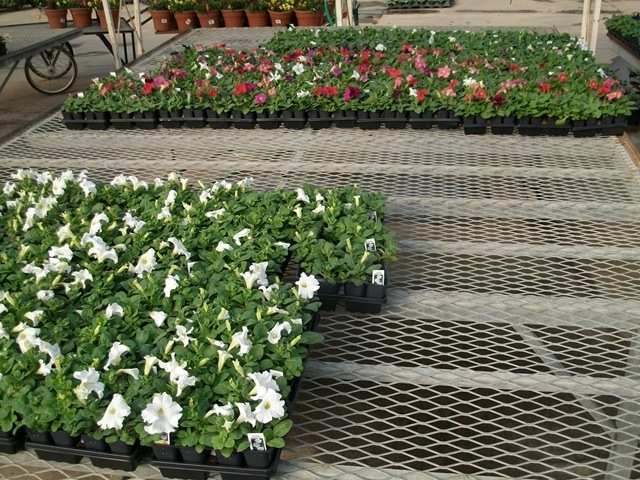 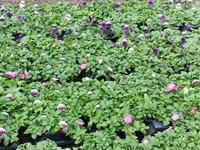 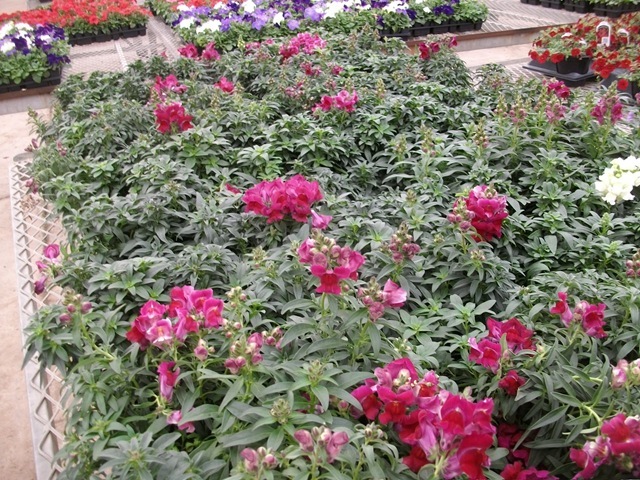 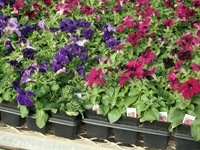 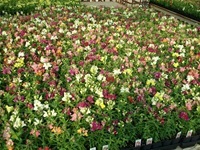 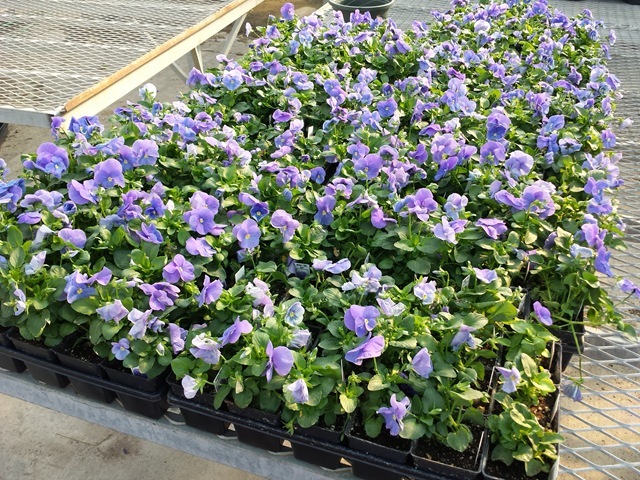 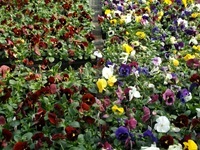 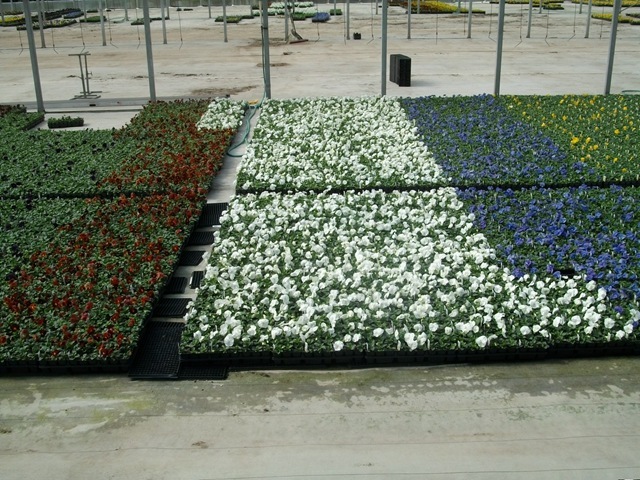 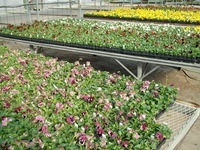 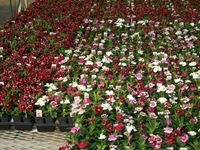 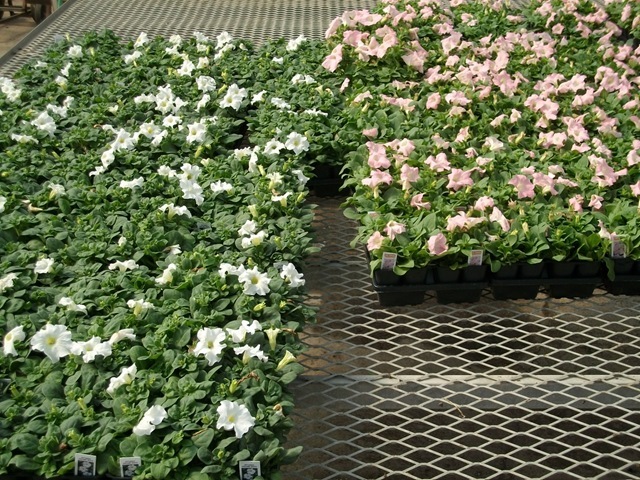 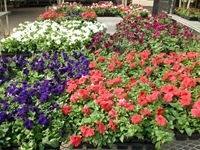 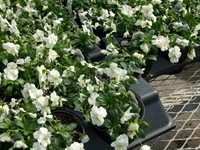 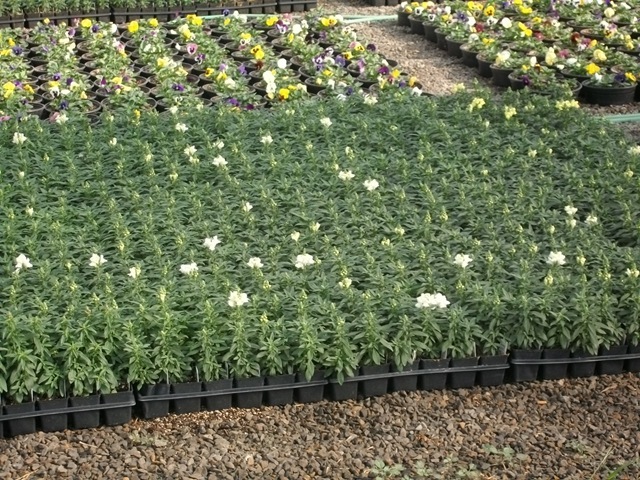 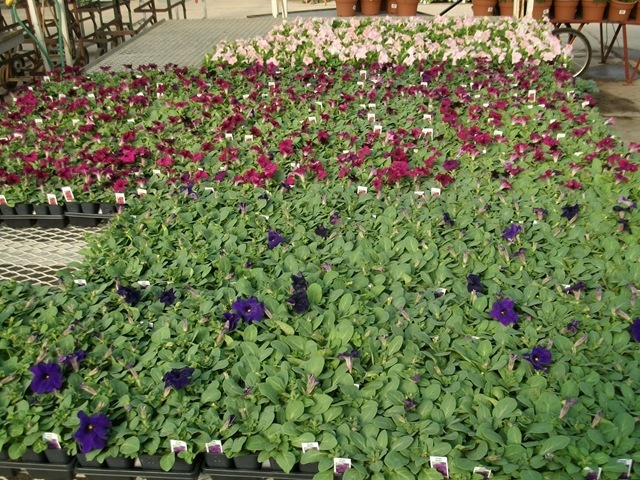 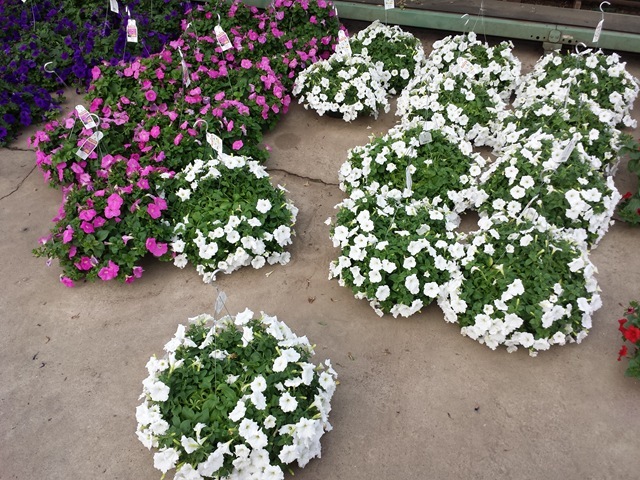 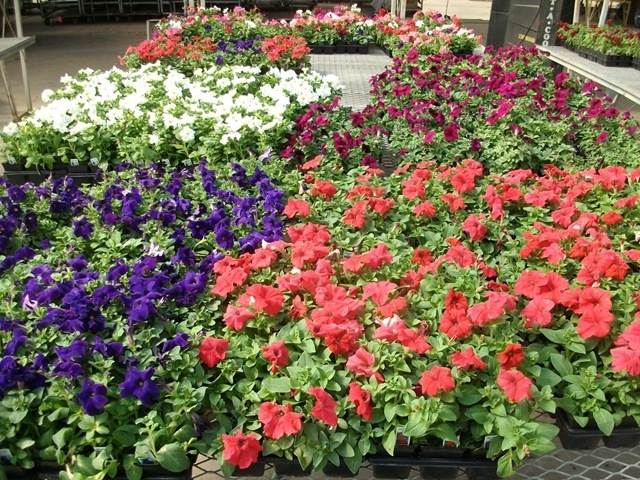 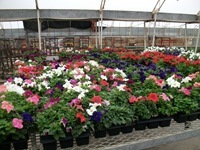 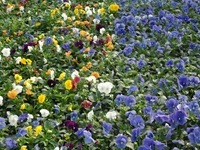 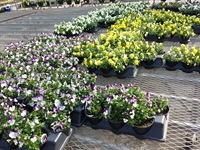 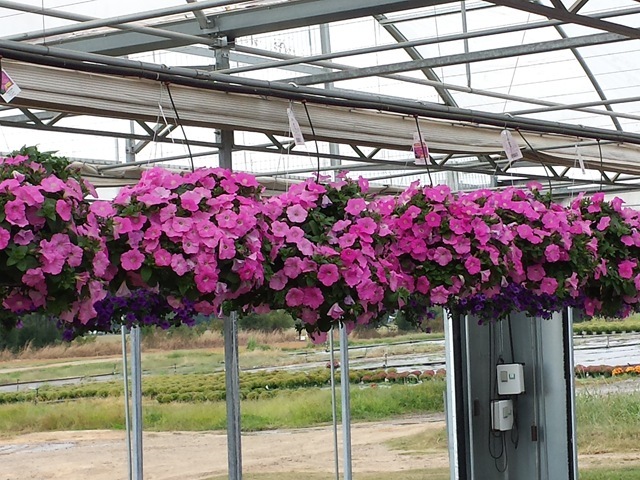 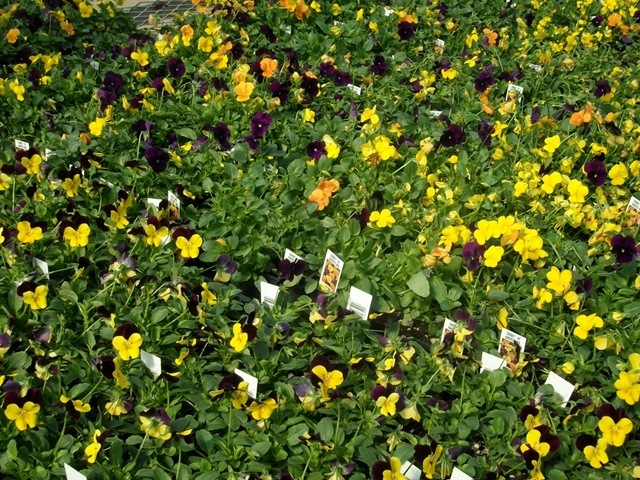 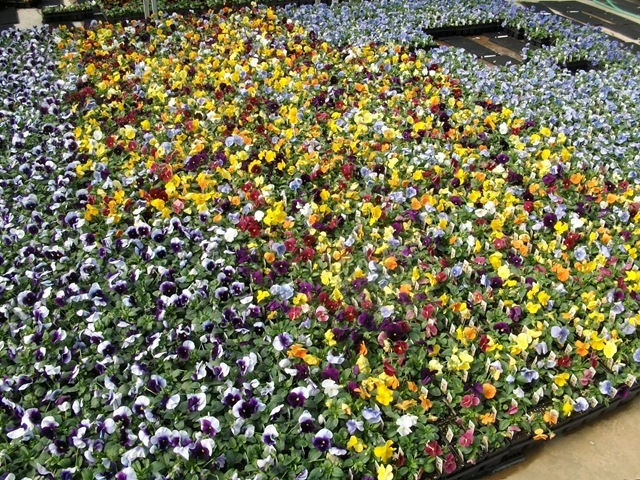 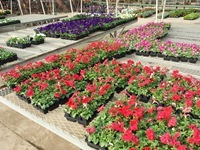 Here are pics of the pansies, petunias, dianthus, dusty miler, snapdragons, panolas and violas we are shipping from now. 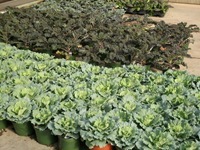 Some of these items are sold out. We are pulling from 2 crops on most of these categories. This is the last of the dianthus and dusty miller. 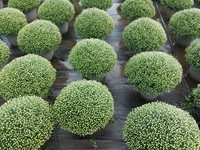 We will have more of the other items in upcoming weeks. 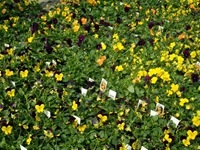 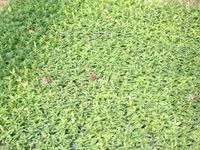 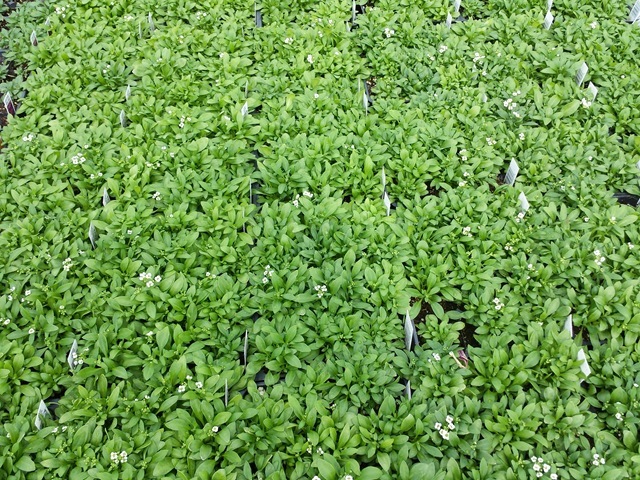 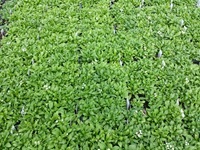 This is the next crop of J6 pansies, panolas and violas. 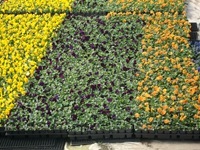 We have already stated pulling a few colors from it as seen by the empty spaces. 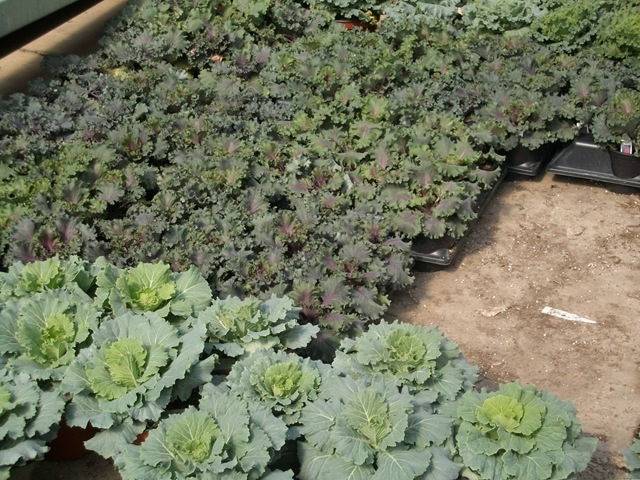 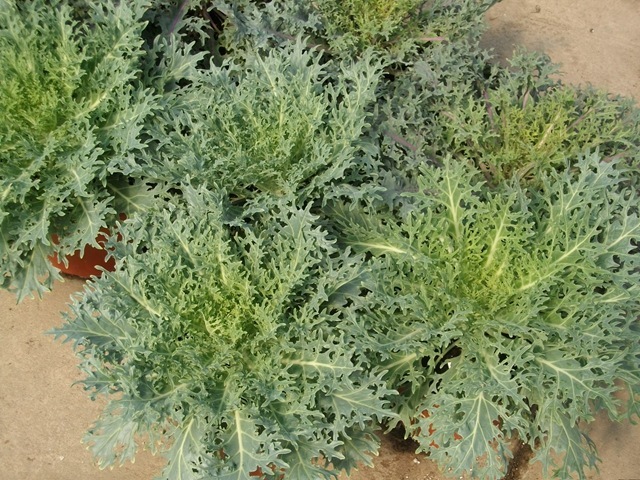 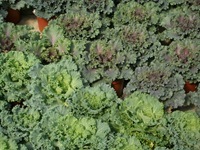 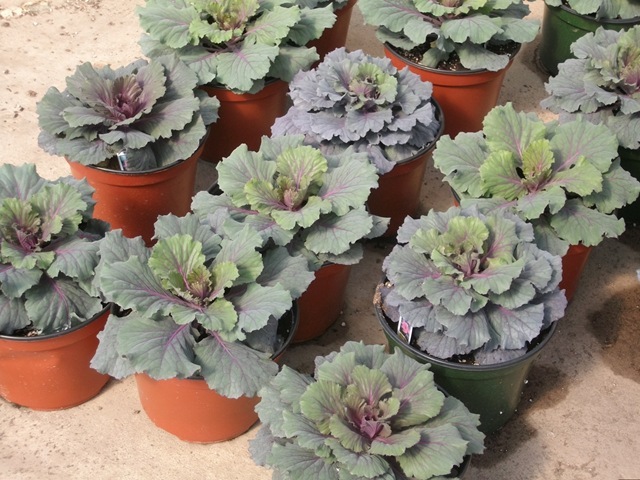 We still have good numbers for most of the cabbage, kale, mustard and chard. 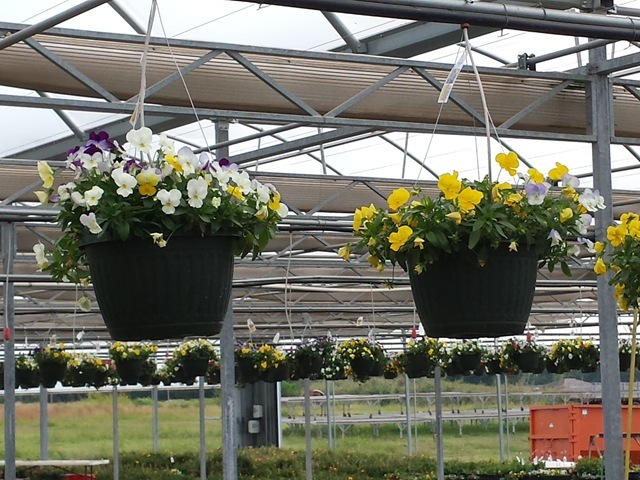 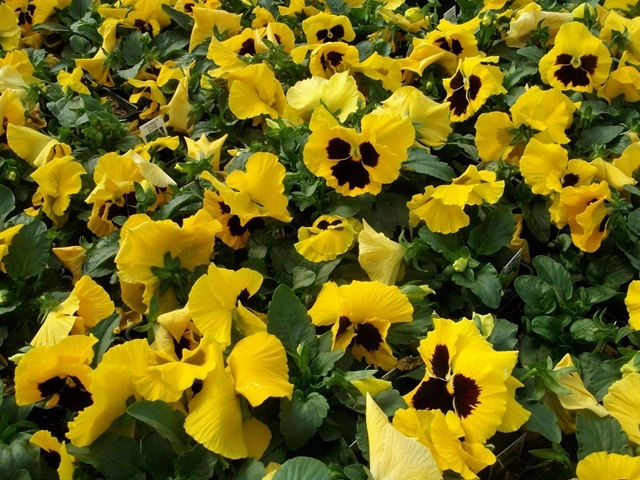 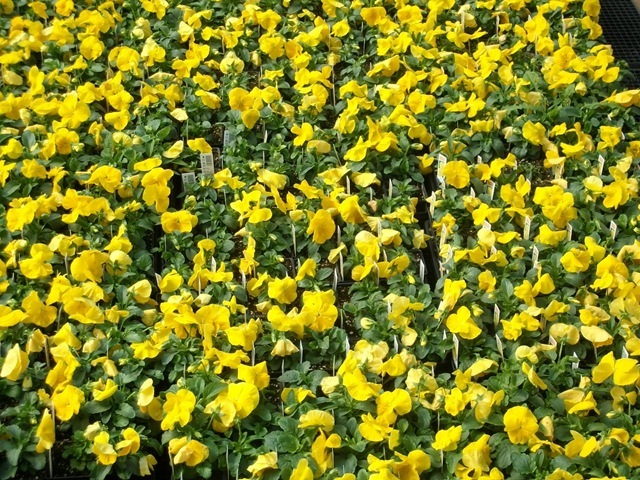 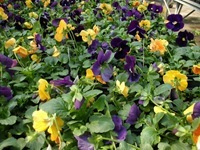 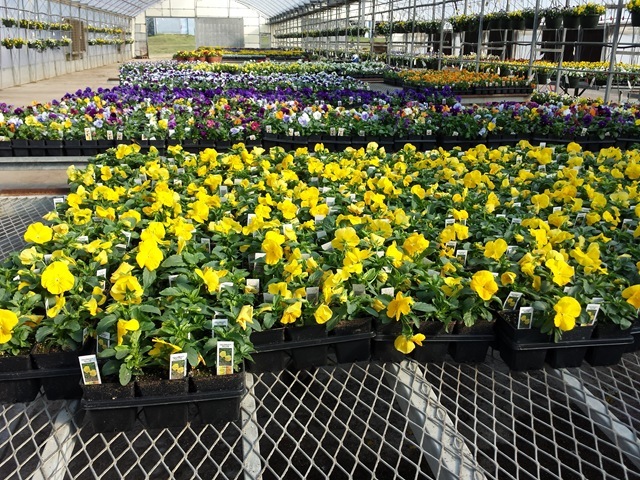 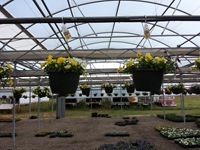 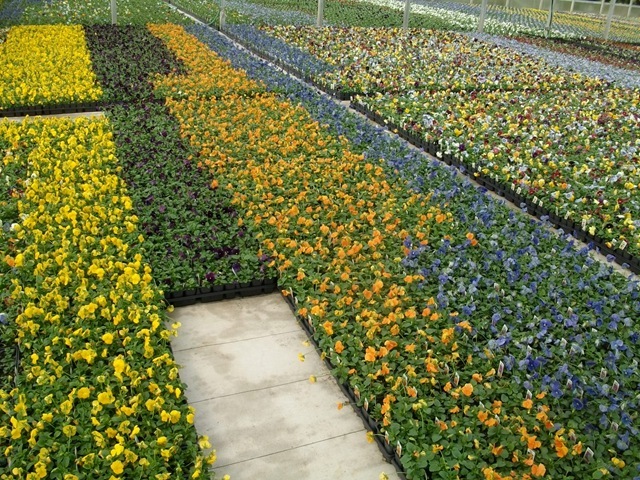 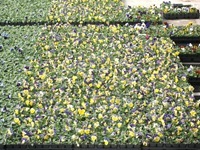 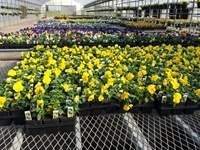 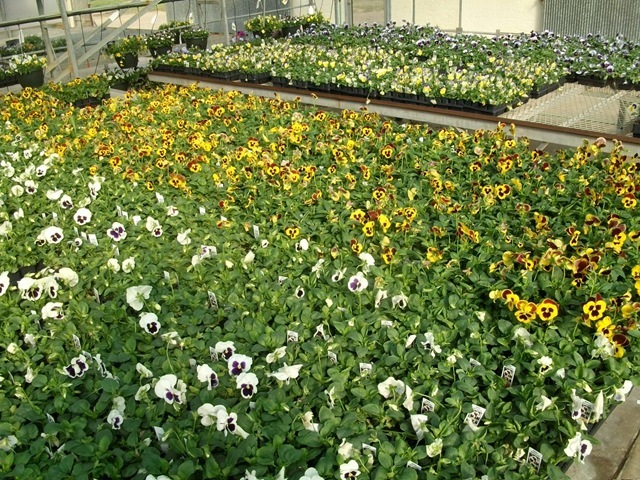 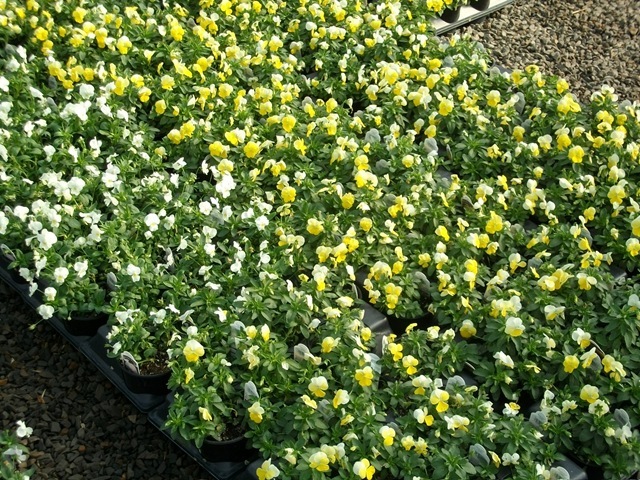 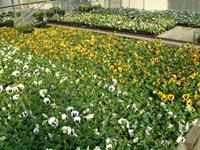 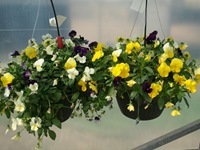 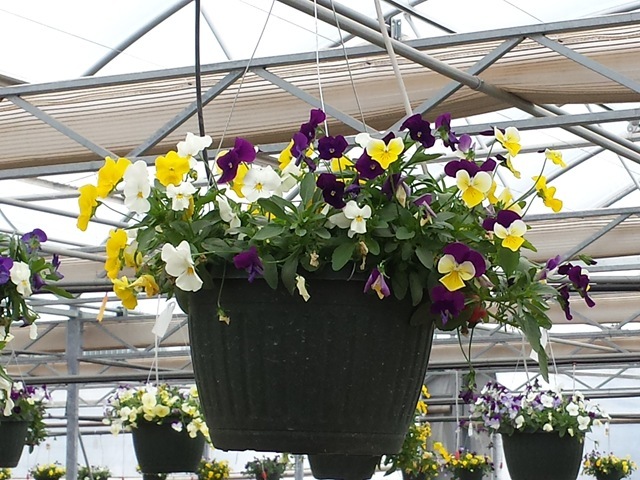 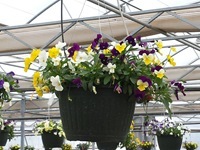 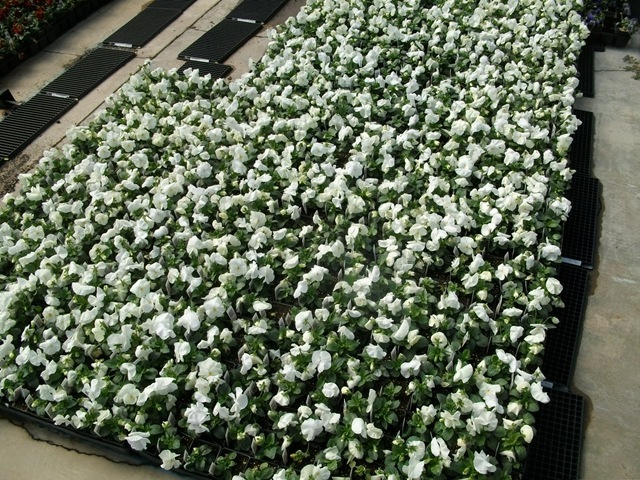 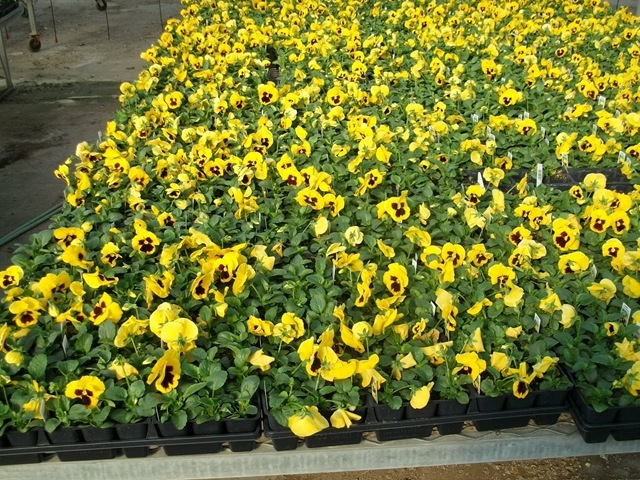 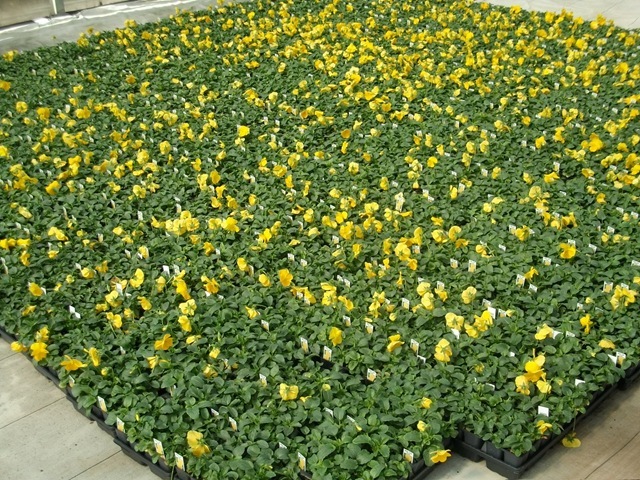 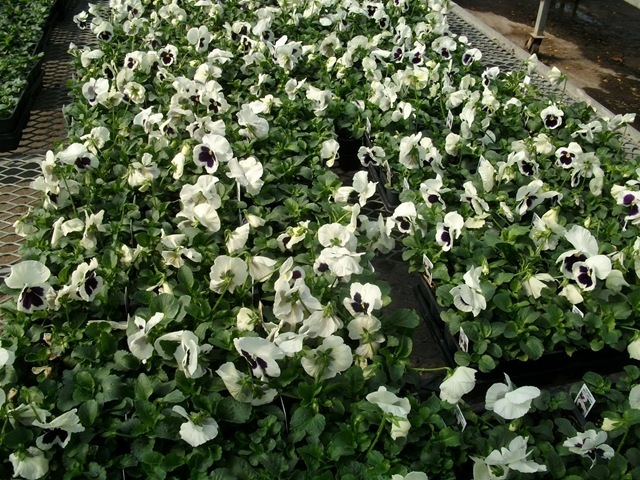 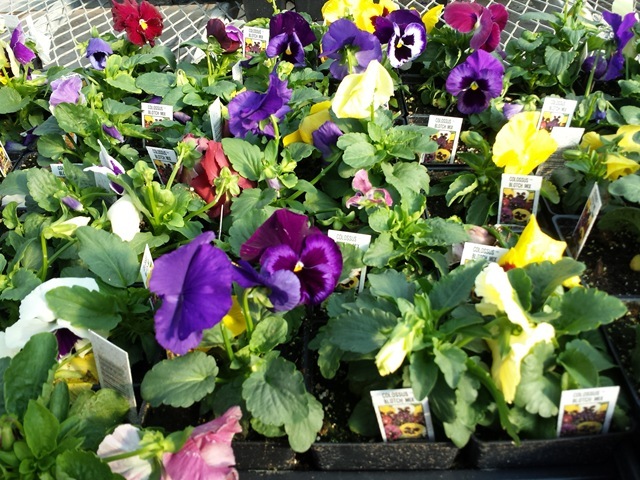 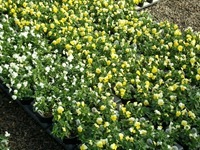 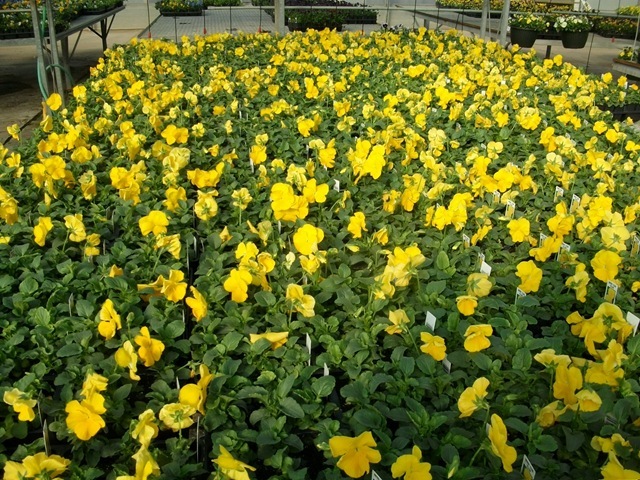 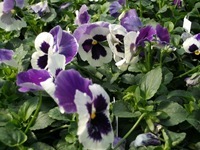 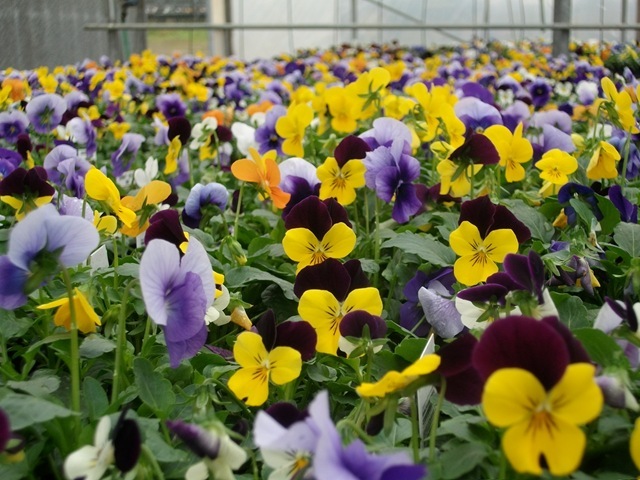 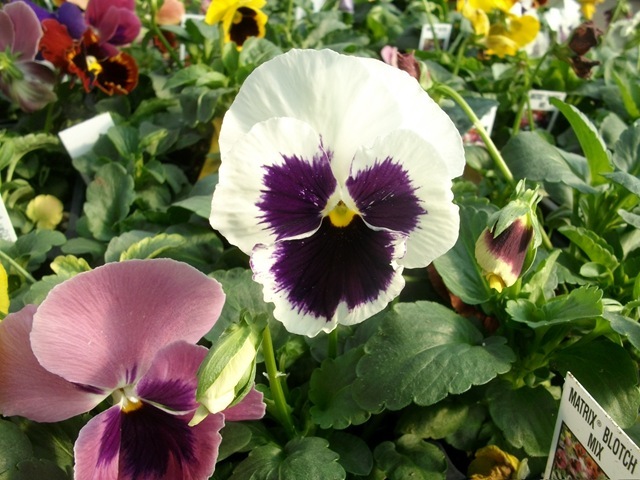 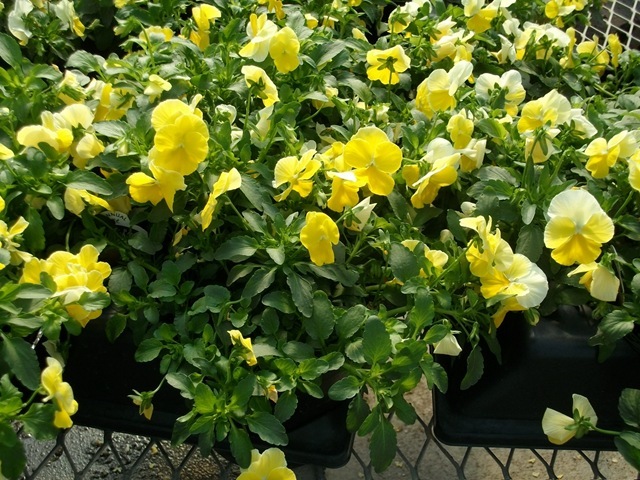 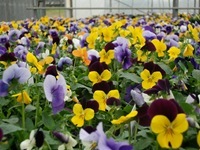 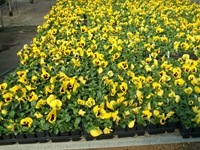 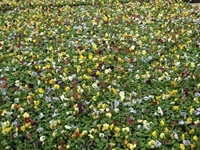 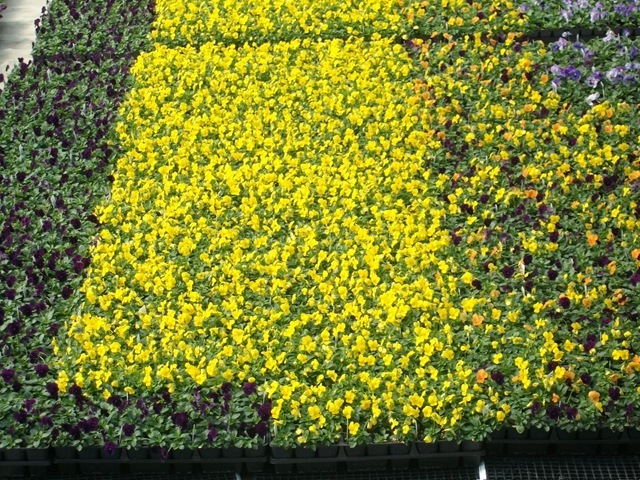 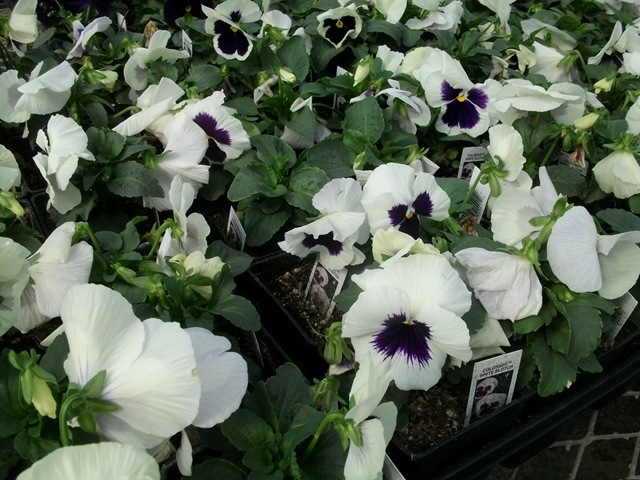 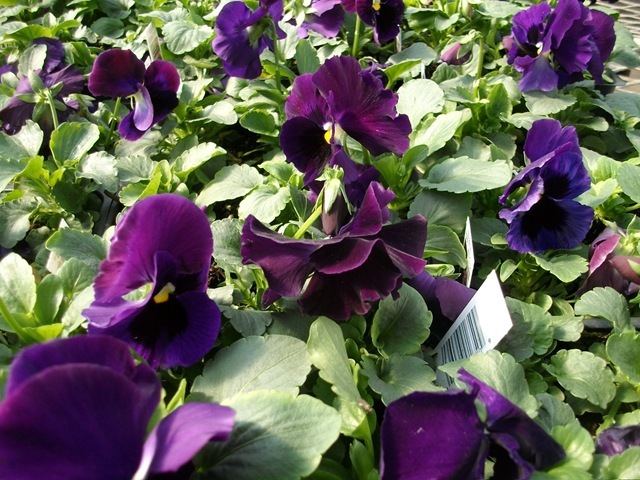 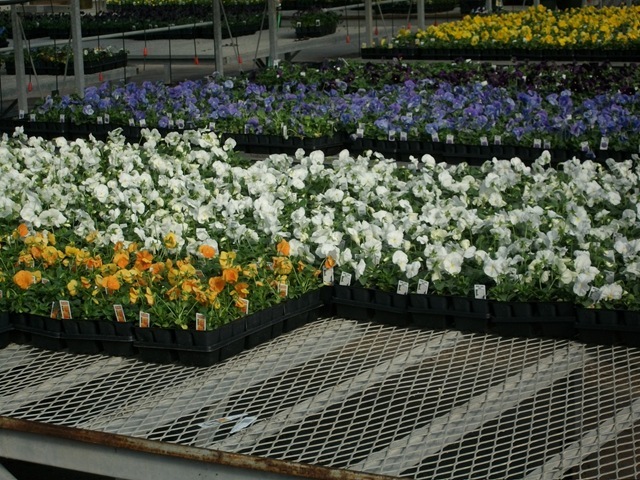 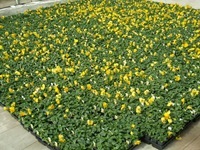 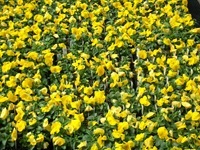 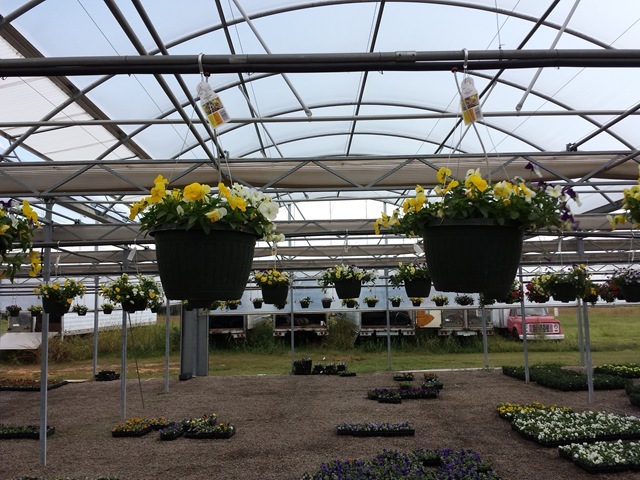 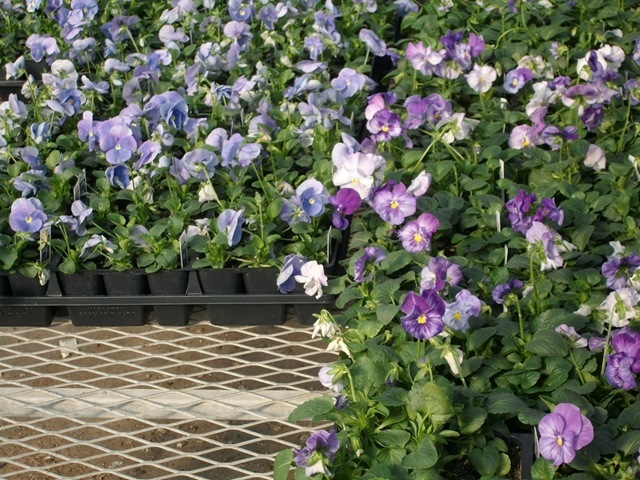 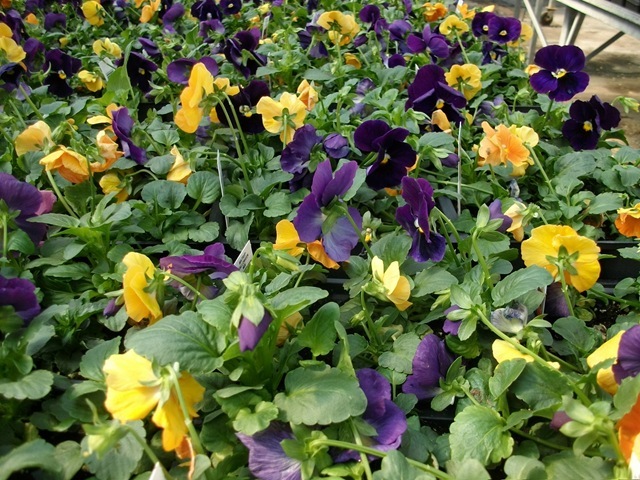 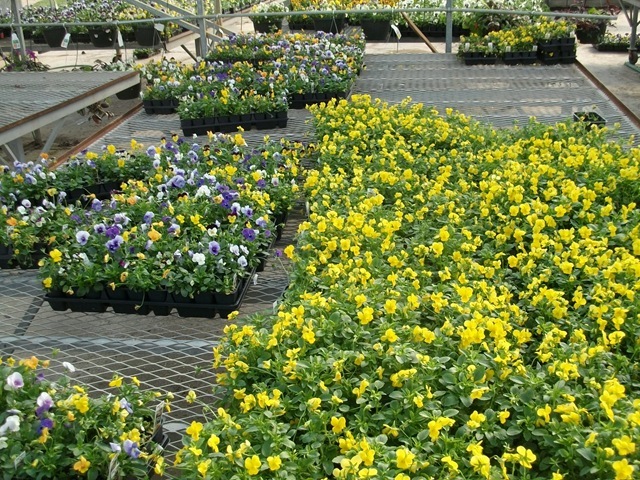 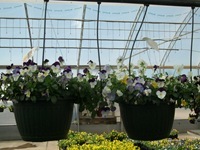 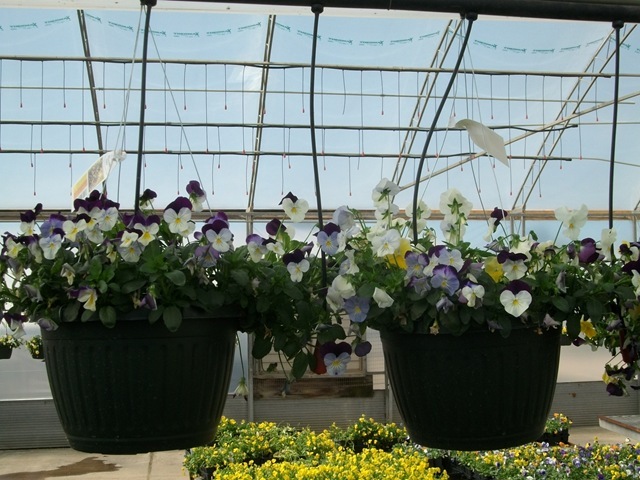 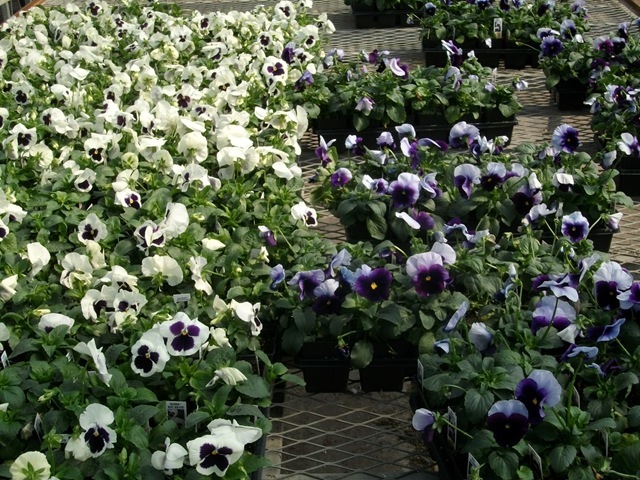 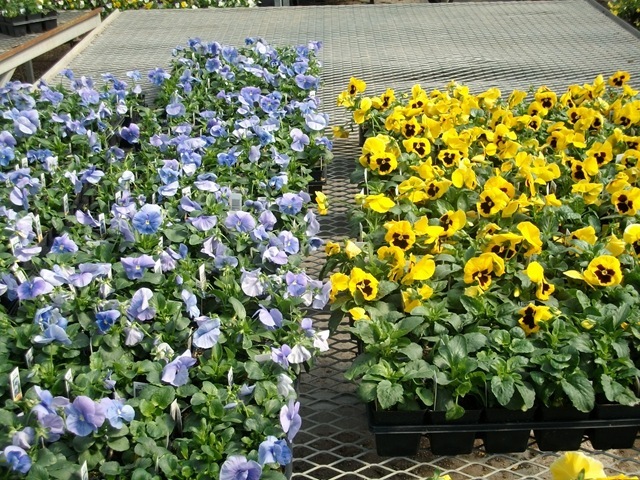 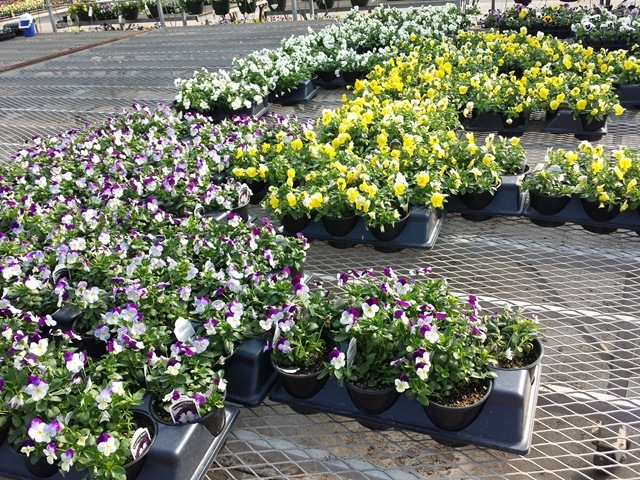 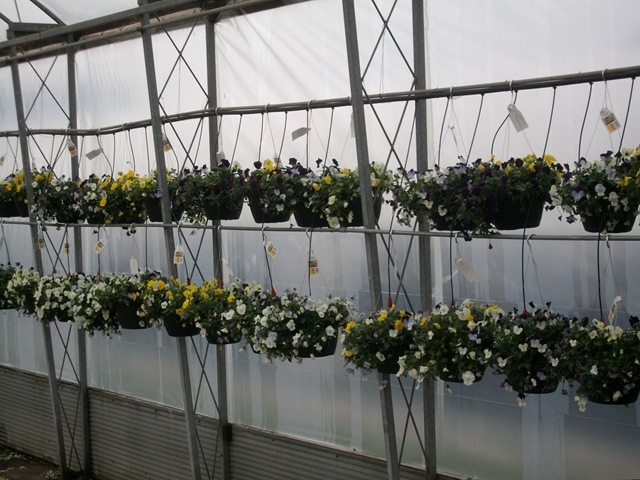 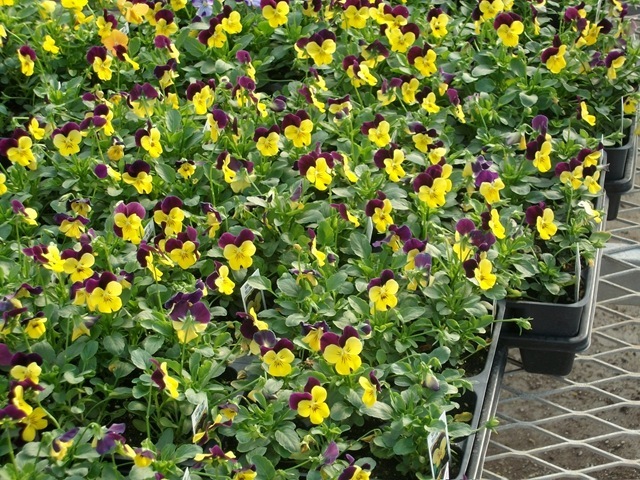 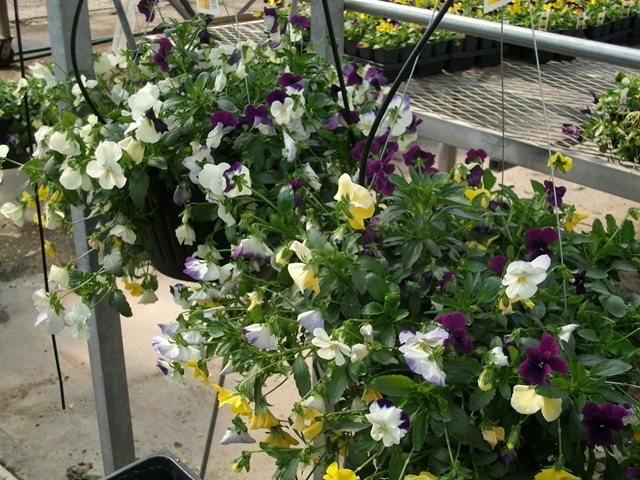 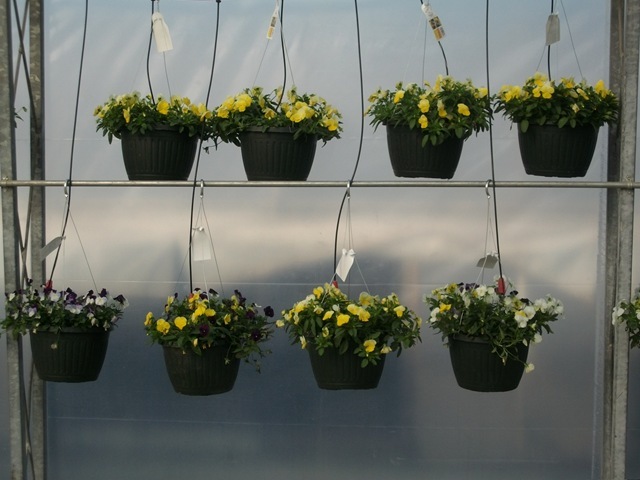 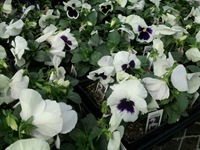 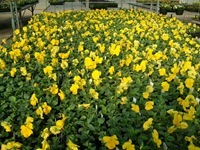 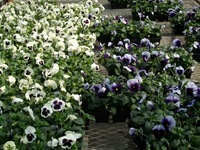 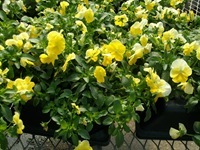 We finally have some #6 Cool Wave Pansies ready – yellow, white and violet wing. 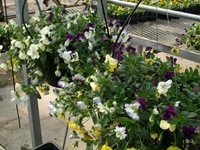 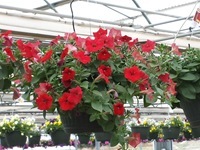 The Ferns and Petunia baskets look good but it has been too warm for the Cool Wave Pansy baskets to size up. However, I put them on the list as small if you need some. 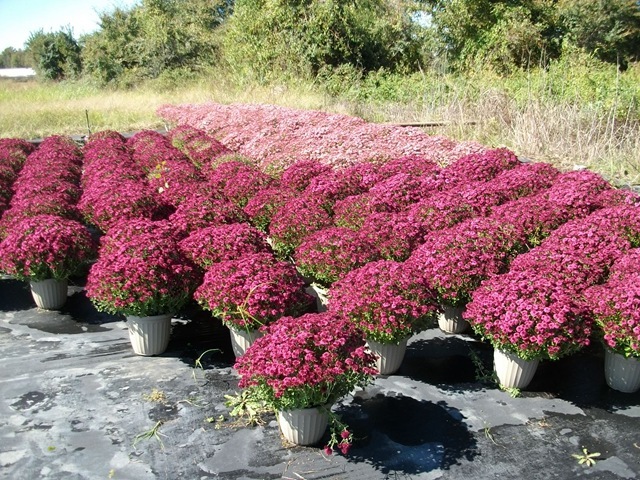 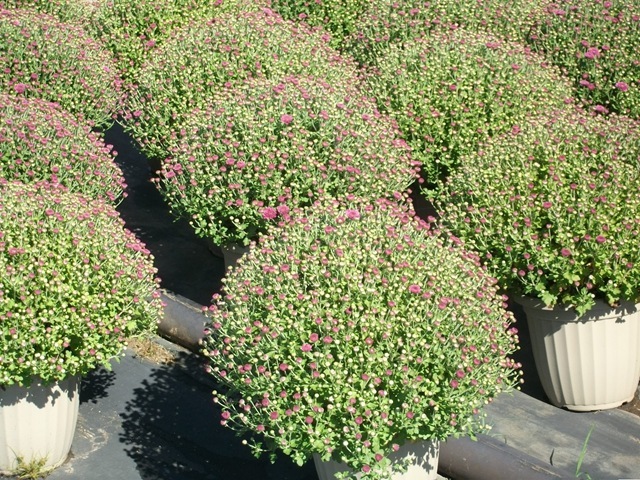 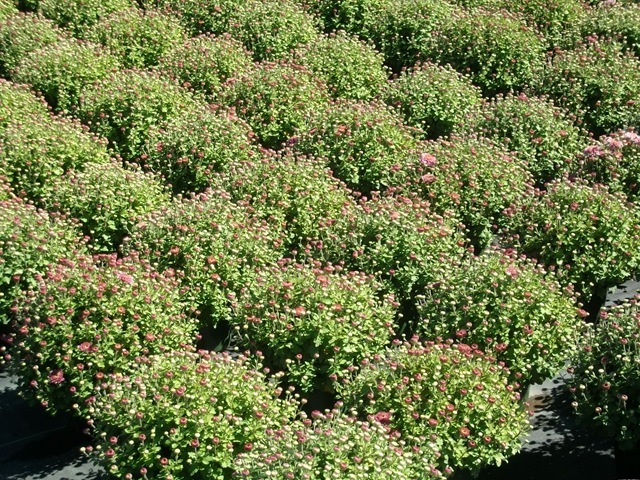 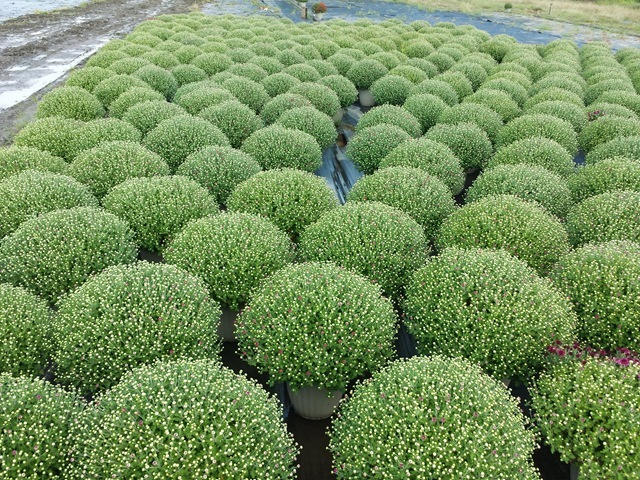 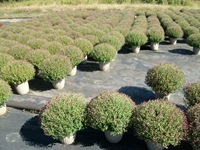 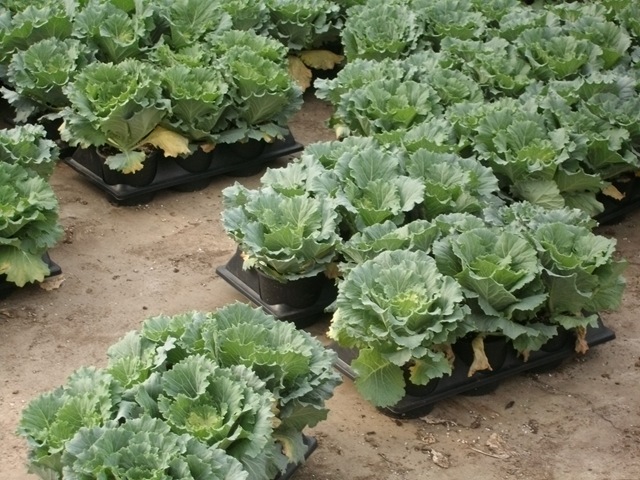 As of today (Friday 10-4-13) this is what the #12 mums we are shipping look like. We will be into other varieties early next week which should be comparable to these in relation to the amount of color showing. 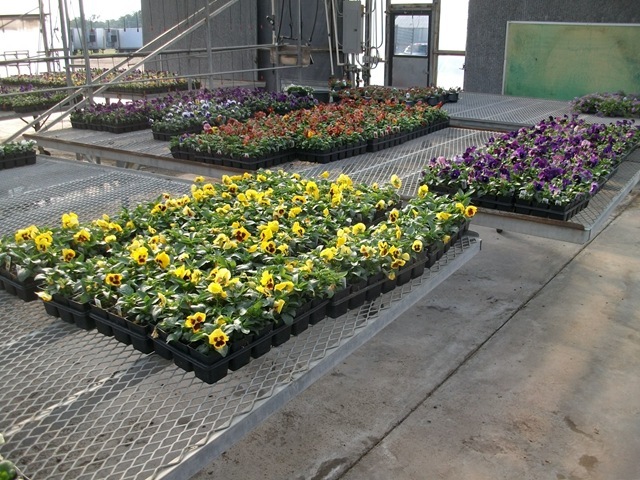 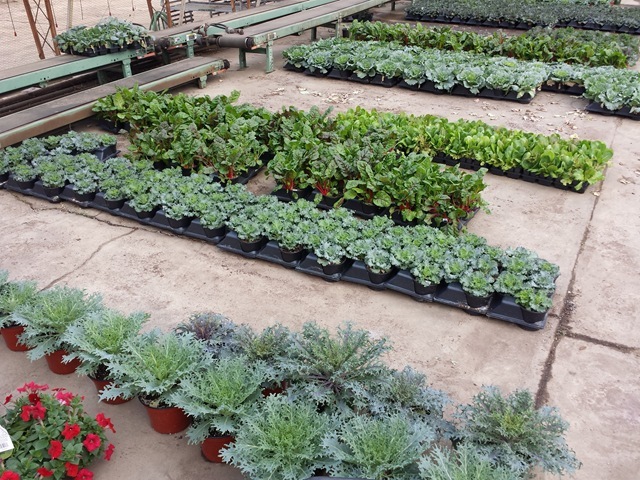 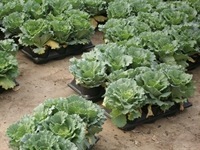 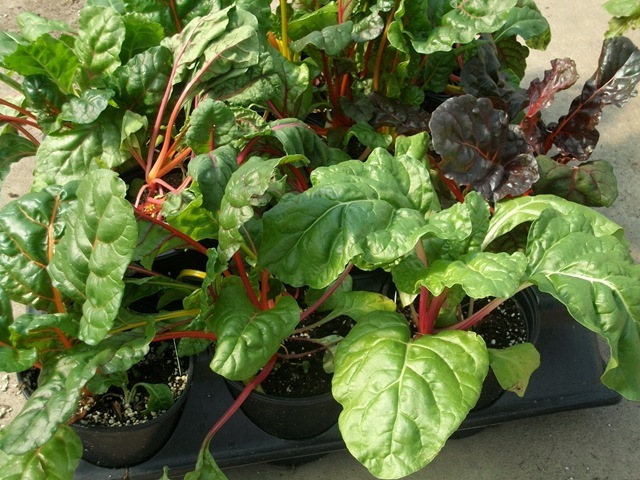 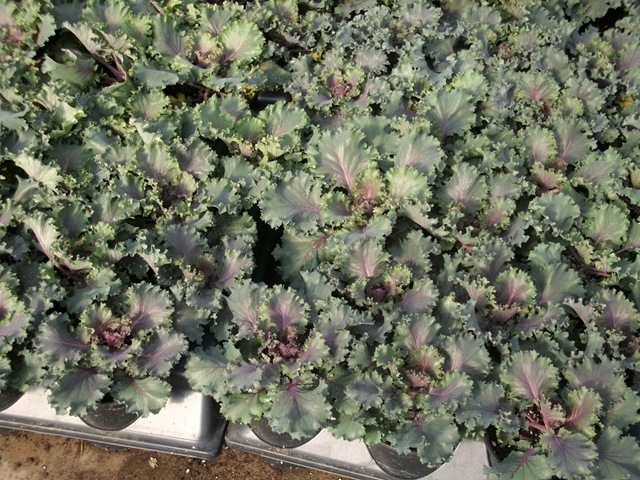 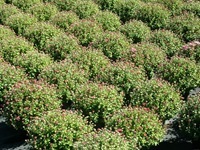 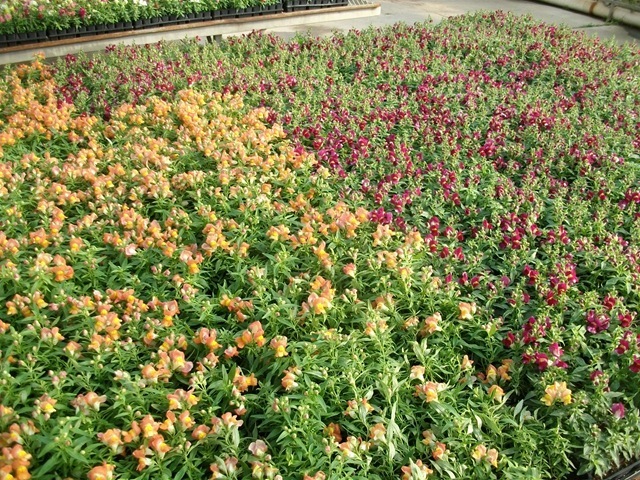 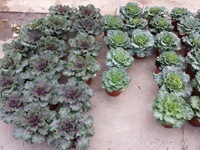 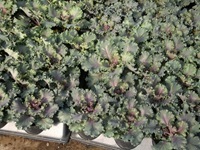 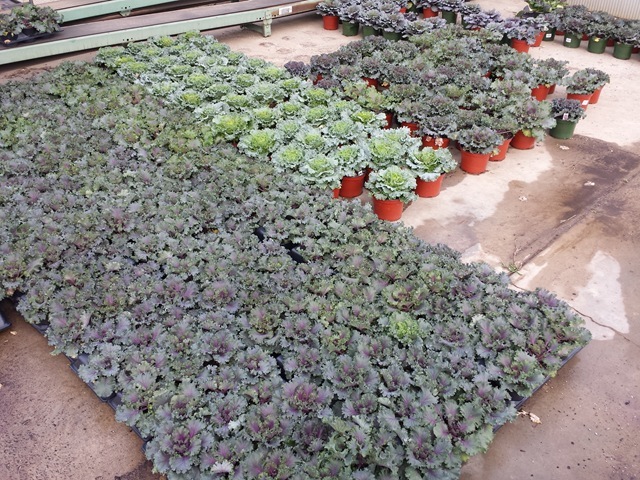 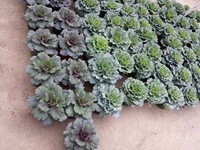 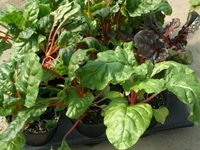 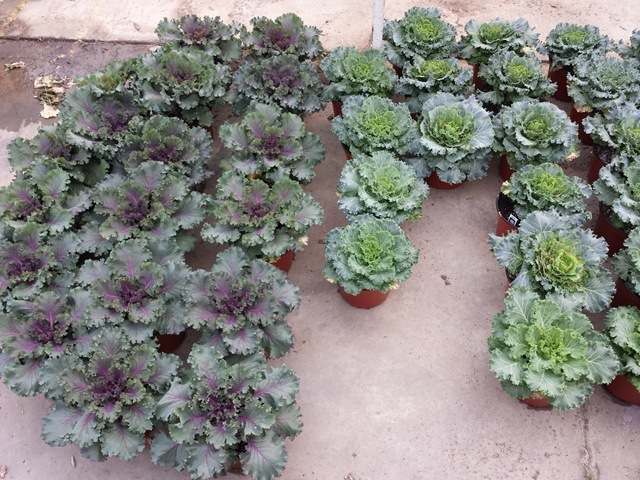 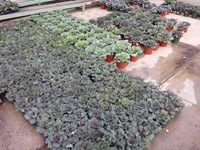 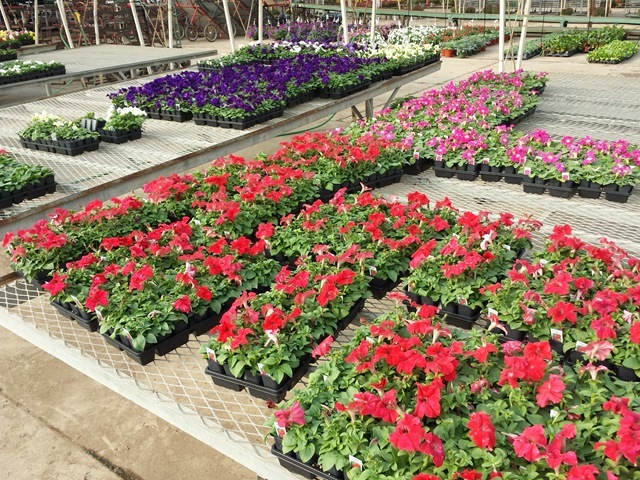 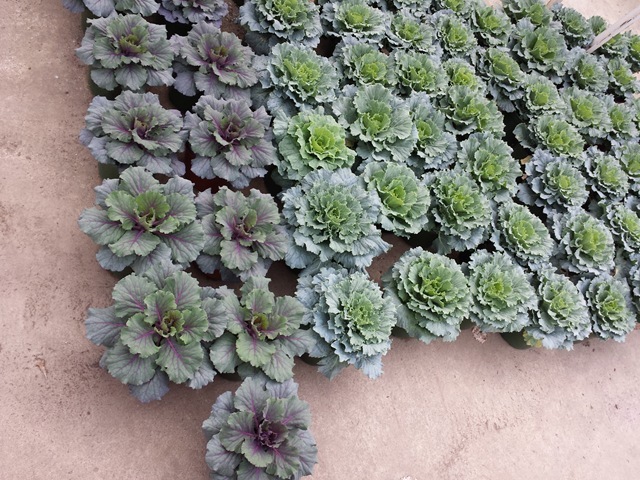 These varieties will have more color when we finish shipping them out Monday and Tuesday. 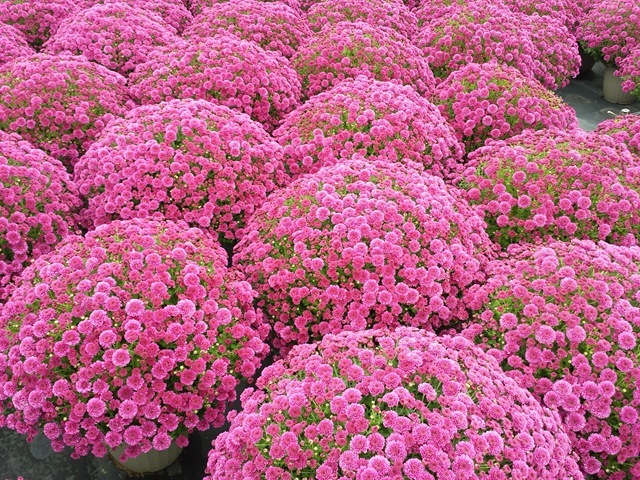 Also we might come up with some #8 mums for the end of next week. 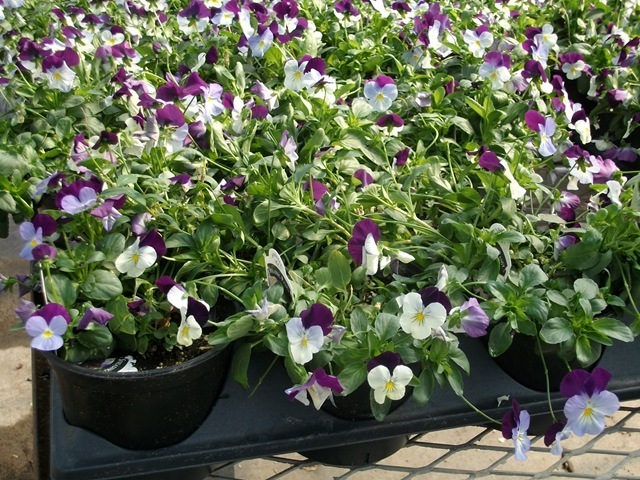 We are pulling from 2 crops on all our 1801 items but we still are somewhat limited on our 1801 pansy availability.